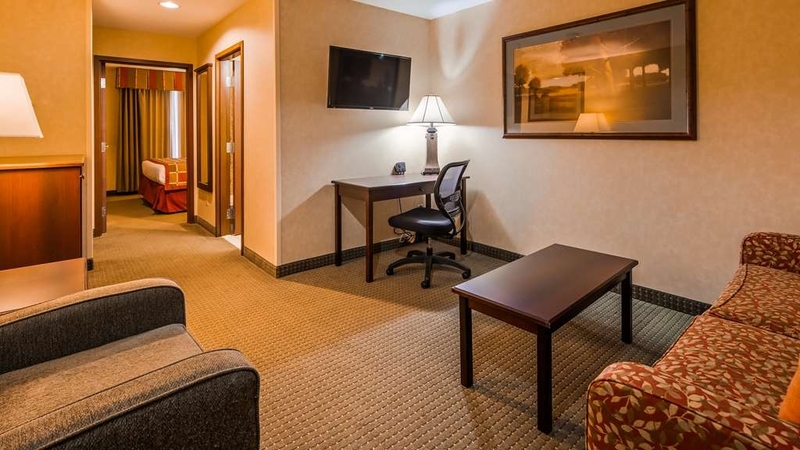 The Best Western Plus Ticonderoga Inn & Suites is ideally located in the center of Ticonderoga. Come and experience our hotel near the major tourist attractions. Best price guaranteed and exclusive deals. Fort Ticonderoga is a nature-lovers paradise. The Adirondacks and Lake Champlain fishing are just a couple of things that draw guests from all around the world. Ticonderoga is a veritable oasis in the state that's known for the city that never sleeps. What you may not know is that the Empire State also has plenty of Mother Nature's best. The Adirondack Mountains surround the Ticonderoga area, providing great hiking, scenic views and a nature-lovers paradise. Fort Ticonderoga located just minutes from the hotel, provides living history experiences, water-way excursions, canoe rentals and an overall day in the life of the soldiers who lived and worked within the walls of this historic gem. Nestled between Lake Champlain and Lake George. Ticonderoga hosts fishing tournaments, history lovers, hikers, bikers, business travelers for International Paper and National Grid. and family vacationers all year long. Located less than an hour away from Middlebury Vermont. home of Middlebury College, the Snowbowl, local Vermont breweries and wineries, and many locally owned quaint shops. sports teams, and visitors alike make the short scenic trek between neighboring states. Maybe you're here for the superior location to the Fort and Lakes. There are great packages all year so anytime is the best time to visit. The adjacent location to the International Paper Mill draws in business travelers that are looking for comfort and quality on their trip. This Ticonderoga hotel is also close to Middleburg, VT if you're looking to inject a little charm into your vacation. Fishing, snow-shoeing and hiking are beloved past times in this area. This winter wonderland boasts some of the most beautiful white landscapes in the world. Pack your down jacket and prepare for a winter like no other. Whether your sport is blazing new fields through the snow or taking advantage of the majestic spring months, everything a natural beauty lover desires is right here. This completely non-smoking Ticonderoga hotel is the proud host of many fishing tournaments. We're also the second home to business travelers with the US Border Patrol, State Department of Transportation, and traveling nurses working at the hospital. The two gentlemen who worked at the Mobil Gas station down the road highly recommended this Best Western Plus hotel. They were right and I thank them from the bottom of my heart. The ladies at the front desk, especially Jeanne, were extremely courteous, patient, and professional. They did everything they could to adjust the room rate (internet versus walk-up) and answered questions in regard to reward points and current promotions. They were super at their jobs. The room was lovely, large, and spotless. The beds were comfortable and the bathroom was pristine. I slept like a baby. Breakfast was scrambled eggs and three sausages cooked to perfection by an industrious woman. Waffles, hard-boiled eggs, assorted breads, pastries, coffee, and juices were available. I accidentally spilled a cup of hot coffee on the floor. The breakfast lady came out to help mop the floor. Then, she offered to fill up my second cup of coffee. The location was quiet and about 20 minutes from the bridge that goes across to Vermont. There was a McDonalds in the vicinity. A Mobil gas station with an attached convenience store replete with hot foods and big jugs of Vermont maple syrup was also within easy striking distance. An excellent stay with no regrets. The staff is great, the restaurant is awesome, and the rooms are nice and clean. Everything about this place is great. I got 2 bottles of water and 2 snacks checking in. The bar and restaurant was excellent for dinner, and the free breakfast was really good too. The room was really clean with a nice big TV and nice bathroom. One thing is the shower must be one of those tubs that goes over the old tub. It was REALLY slippery and it felt a little odd to step on. I thought for sure I was going to fall. I don't know what you can add to it, but if definitely needs something. Had a one night stay before exploring the mighty fort. The staff was very nice and personable. Very knowledgeable about the area and gave great advice. Room was clean and comfortable. The included breakfast had a lot to offer. Fort Ticonderoga is a wonderful historic site to visit. Our staff members work very hard to make everyone's stay as enjoyable as possible and we appreciation your recognition of this! We are glad to hear you have a good stay with us. I stayed for a business trip up near Elizabethtown, NY. I like the best Western because of the business center and that they offer breakfast with their stay. I ate dinner at the restaurant. I enjoyed my stay. I am so glad to hear that you enjoyed your stay with us! We hope that if you are ever here again in the future you'll choose to stay with us again. Have a wonderful day! I stayed at the Ticonderoga Best Western with a group of my customers while in town for meetings. The hotel was perfect for a cold and snowy night in the Adirondacks. The front desk staff along with the restaurant and lounge staff were top notch. The hotel was very clean. The restaurant provided a wide variety of options that were all very good. I am glad to hear that you had a good stay with us. Our staff members work very hard to make everyone's stay as enjoyable as possible and we appreciation your recognition of this. "My favorite place north of Albany"
Thank you for such a wonderful review. Our staff members work very hard to make everyone's stay as enjoyable as possible and we appreciation your recognition of this! Check in was quick and easy. My card was charged for more than the actual final bill. There were less than 10 people staying on the property that night. We were told that breakfast would start at 7:00 am. At 7:45 am when we came down, there was absolutely no food or coffee. The manager on duty told us that an employee had not showed up and she was doing her best to cover. She told us that we could make a waffle and have coffee once it was ready. Very disappointing as my wife is a former manager there and told me what is supposed to set up and ready for breakfast. Such as eggs, sausage, bagels, muffins, yogurt, breads, coffee, etc. The normal you would expect. Since we were hungry we opted to eat at the Wagon Wheel. They have excellent food by the way. Upon returning at 8:45 am, we found that there was only coffee, juice and toast available. The manager and the employee that had shown up late were chit chatting at the front desk. Still no food out. We talked to another couple staying at the hotel and they had told us how disappointed they were with how the breakfast was set up. Needless to say, they opted to eat out as well. Other than that, the room was nice and clean. We are sorry for your experience at our hotel. We work very hard to make sure everything at our hotel is at the highest standards, and I am sorry we fell short in your eyes. If you are ever in the area again we'd love for you to give us a second chance. You can contact Allison, GM, at 518-585-2378. This hotel was much nicer than we expected. It appeared to have been recently renovated, the rooms were basic but very clean, had all the necessary amenities including a refrigerator, and a better than average hair dryer. We did not use the pool but the exercise room was very well equipped with more machines than you would usually see in a hotel, towels, water cooler and bathrooms. The only thing we noticed was a funny smell in the corridor but I think maybe it was the chlorine from the pool area. Thank you for such a wonderful review! We hope that if you are ever in Ticonderoga in the future you'll choose to stay with us again. As expected, basic no frills motel, small breakfast of waffles (need new waffle maker, lost it's non stick coating), yogurt, shelf stable fruit cups, 2 cereals, (stale) bread for toast. Room was not made up one day because we had the do not disturb sign on the door until 10 am (left after that and removed the sign), recommend to let staff know that the room is now free. Quiet (except for the fridge) basic room. Bed a little hard for me but comfortable enough. Clean bathroom. Overall good value. As noted by others, no elevator, so ask for 1st floor room if difficulty with stairs (interior). I am sorry to hear about your experience with breakfast and housekeeping. We do have an elevator and it is located towards the front of the building. 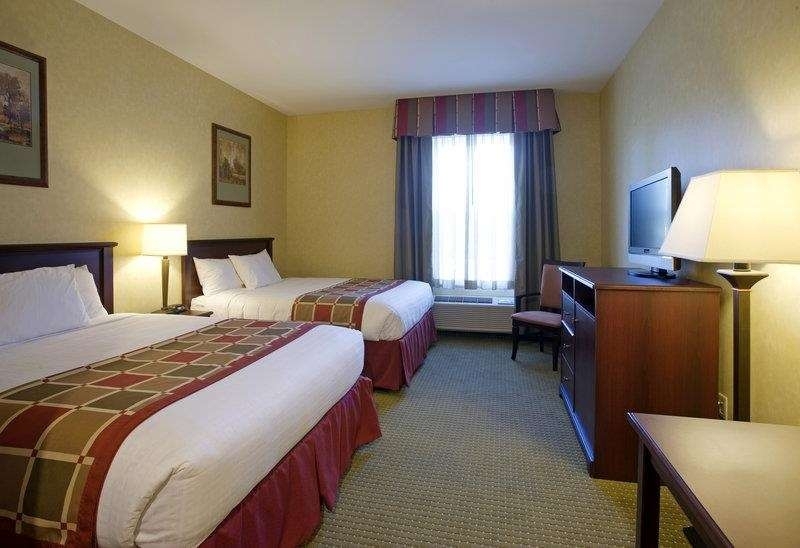 Best Western Plus Ticonderoga Inn & Suites is probably the best option close to Tincoderoga. It is simple but clean, confortabvle and the staff makes a lot of effort to make you feel welcome. Restaurant is good and, surprisingly, it has a fast and reliable internet connection. "Our Hotel of Choice for our Ticonderoga Trip." We booked this hotel since it was close to our destination (the Star Trek Original Series Set Tour). 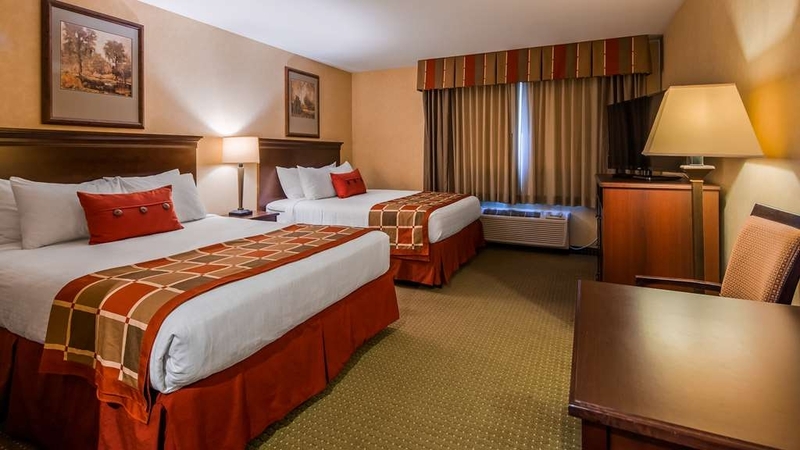 The price was reasonable, and we have had good prior experience with Best Western hotels. Our room as an ADA room with a king bed. The room was very clean and comfortable, perfectly adequate for an overnight stay or even longer. We plan on returning to this area sometime next year to do the historic sites and will most likely book here. The included breakfast was very good and we met a lot of very nice people, who asked to share our table (since we had a large table). I also liked the idea of the "Clean Remote" for the TV, although this is probably also in use at other chains, it is a good idea. We called to see if they had rooms available for the night. Thankfully they did. It was a Wednesday so they told us to make reservations if we planned on eating. It was WING night and they busy. We had a couple cocktails in our room and came back around 8pm to eat. It was still busy so we sat at the bar and had Wings of course. Very good with a lot of selections on sauces. My husband had some carrot cake that was very good. We saw more desserts and they all looked great! Our Wing Night is very popular! I'm glad you were able to get in and eat some wings along with the delicious carrot cake. If you are in town on a Tuesday we have all you can eat Pasta Night which is also very popular and yummy! Have a wonderful day! Very nice rooms which are very clean. Our room had plenty of room to accommodate 2 queen beds. The bathroom was clean. Breakfast is included and was quite good. Parking is handy. The person who checked us in was most helpful with suggestions of things to do. He also gave us directions which is always appreciated. We would stay here again. I am glad to hear that you would stay here again. Our staff work very hard and we appreciate your recognition of this. We hope to see you again in the future. There is no transportation provided by the hotel; however, there is a local cab and he was very accomodating. The hotel staff put us in contact with the local driver. We found the staff very friendlyt and always willing to help. Our staff members work very hard to make everyone's stay as enjoyable as possible and we appreciation your recognition of this! Thank you for choosing to stay with us while visiting Ticonderoga. Rooms were clean, price not bad. It was a nice hotel. The clerk was very friendly when we checked in, but when we got to our room, we realized that we were given a room with two queens when we had booked a king. The clerk was able to put us in the last king they had, but when I explained that we had booked a king by phone that morning, she said, no, it was book as two queens. She didn't even offer an apology for the mix up and it left me with a bad feeling. The room was very nice, though. "Average hotel in a nice location at a good price. We would stay here again." The staff were generally friendly and helpful with a few exceptions. The room was fine but unexceptional. My wife had one conversation with the manager, who really impressed her, that gave hope that the quality of the hotel was going to be upgraded in the near future. The actual location is very nice. We would stay there again if we get another chance to visit Ticonderoga. I am glad to hear that you'd stay with us again if you were in Ticonderoga! Hope you are having a wonderful day! They call this a Plus hotel but I do not know why. I did not see any pluses. We were on the second floor near the real entrance. What we found was the smoking section where smokers went out to smoke and then put their butts in a pot which then burned and the smell come into our room. The room was old, the hallways were old, and the pool was small (we did not use it. We went to the bar. There was not any great appetizer food options at night, nor deserts. The bar had limited choices for top shelf liquor. Beer was limited to the lower tier. We did not stay long since the bartender was NOT friendly at all, did not try to upsell drinks or food. This was definitely an unfriendly bar. "Average hotel on the edge of town"
Stayed at this Best Western in Ticonderoga on a recent trip thru New England. The room was clean but nothing special. We ate at the in-house restaurant which was OK. We could hear people talking in the hall at night and the maid service started before 8:30 in the morning in the room next to us. "Not worth the added cost of a Best Western "Plus""
We stayed at the Best Western Plus hotel in Ticonderoga NY last week while visiting Fort Ticonderoga. This hotel is advertised as a “Plus”, with “spacious guest rooms offer plush bedding and stylish bath amenities .… where stylish, modern design meets exceptional service and value”. That is not what we experienced. Yes, it has an indoor pool & fitness center. But that is fairly common these days and we really did not see the “Plus” value in the hotel. The desk clerk had obviously had a bad day and was not friendly. He talked about last minute check-ins & cancellations, and yet the hotel was sparsely occupied. We checked in on a Sunday and the restaurant was closed for the day. A restaurant was recommended about 2 miles away. Breakfast was included & available in the restaurant, but the quality was average at best. The WIFI had no signal in the restaurant and had to go to the lobby to use. The advertised cocktail lounge is just a section of the restaurant. The room was clean and quiet. The laundry facilities were good. You cannot walk to anything. But the real issue was the cost. It is well above value with the only benefit being the proximity to the lake / fort / Adirondack Mountains. This was a very nice place to stay. The staff was very friendly, the rooms were clean and comfortable, and the food at the hotel restaurant was VERY good! I highly recommend this hotel when visiting Ticonderoga! "So nice to have a pool"
The hotel has a great pool, and a good restaurant. Even the breakfasts have a good variety of food. But be prepared to wander around the property trying to find a place where the internet connects. This was a real problem both times that I stayed at the hotel. 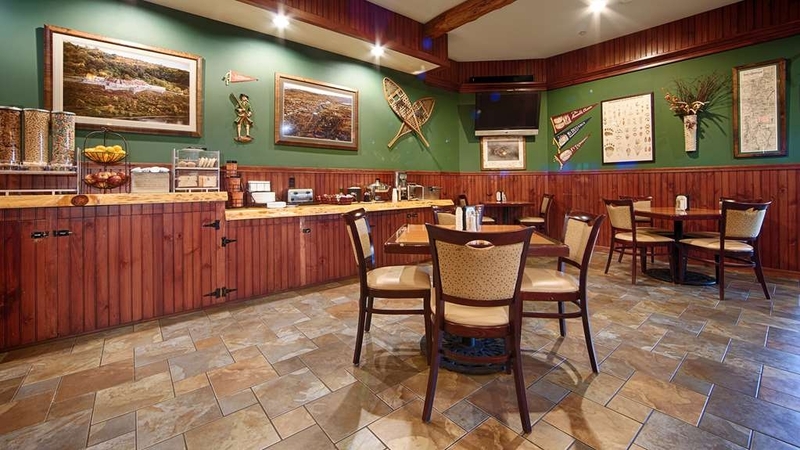 "Best Western - Ticonderoga, NY"
Great location if one is visiting nearby Fort Ticonderoga. 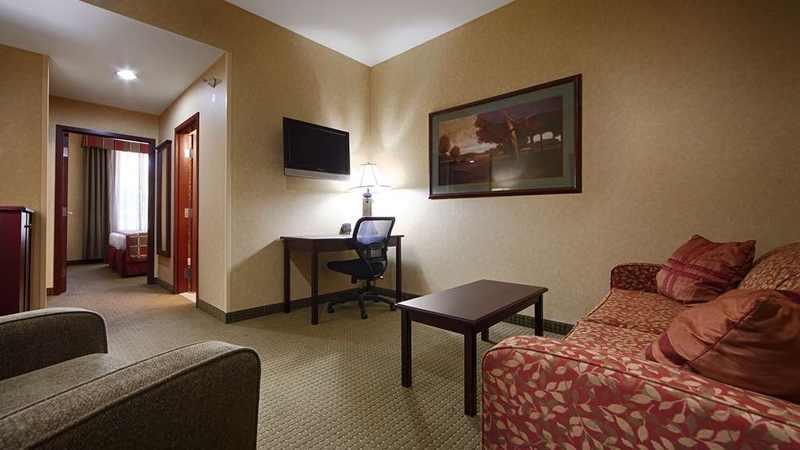 Also great for business travelers staying in the area. Loby and hallway decor somehat dated. Staff very friendly.I would recommend this property to anysone visiting the area. First, I really hate to leave a negative review when I think the operation may be locally owned, and not just a small part of a big corporate operation. HOWEVER, there are some serious issues we encountered with this motel. You should know there is not a lot to choose from in Ticonderoga, and this still may be your best option. When we stayed there we were given the "best room in the house". Upon entering some of the leather furniture had seen better days a decade ago and was cracked and pretty worn looking. Also, I think because it may have been the "honeymoon suite" there was a big jacuzzi tub in the living room area! Pretty unusual to say the least. The rooms, bathroom living area and bedroom were pretty big, but furnished with just basic furniture. The room would have gotten a 3 rating from me, as the facility was just pretty basic, BUT the walls are paper thin and since we were in a room adjacent to the exit, we heard the door opening and closing all night. We also heard people coming and going all night, and we were there on a weekend and there were some drinkers outside until 1:30 a.m. who were pretty loud. The next morning, the trash cans were overflowing with beer cans. The staff was friendly and there was a free buffet breakfast, but the eggs and sausages, even though they were in a warmer,were cold. In short, if they could address the noise this would be a solid 3, but with the noise and other issues, in good conscience I cannot rate it higher than a 2. It is about a 10 minute drive to the fort, which is nice, but just too many issues to prevent a higher review. especially considering the room for two adults and one child was $200 even with a AAA discount. Very nice hotel to stay at when visiting the Fort and Mt. Defiance. Very clean and comfortable. The front desk staff were very professional and helpful. My only real complaint was that the restaurant dining room only holds about 50 people max and there are nightly specials to draw in the locals. After a long day of sight-seeing we stop in to get a glass of wine and to set up dinner reservations. The bar lounge is twice as large as the dining room and we were told we could eat in the lounge or wait to 7:30. My wife did not want to eat in the very crowded and very loud lounge. We were seated in the dining room at 7:40. Maybe the front desk needs to make travelers aware that they should make dining reservations upon check-in because the locals definitely know the drill. We traveled from Toronto to visit Fort Ticonderoga. We arrived very late and were very tired from the long journey. The on-duty staff did a great job of checking us in quickly so we could get unpacked and to our room. They gave us good information on the area and the location of the fort. The room and very clean and comfortable. The bed very very comfortable and the Inn was very quiet so we got a good night's sleep. Internet service good. The breakfast the next morning was very good, with great coffee, locally made muffins and pastries, and other standard breakfast selections. The staff was friendly and helpful our entire stay. "Perfect place to stay if you go to Fort Ticonderoga!" Very clean hotel. Friendly staff. Relaxing pool and hot tub/Jacuzzi. Breakfast has lots of options. Dinner was delicious and reasonably priced. Super close to the fort. The only complaint is the sofa bed is not very comfortable. But if you come to Fort Tonderoga I highly recommend you stay here!! I've long been a fan of Best Western. When I think of places to stay on the American road, it's a name that is as classic as Holiday Inn. I have fond memories of family vacations with these places. In fact, I do miss the old Best Western and Holiday Inn logos. Their old logos were far superior to the new, rather bland ones. But I digress. 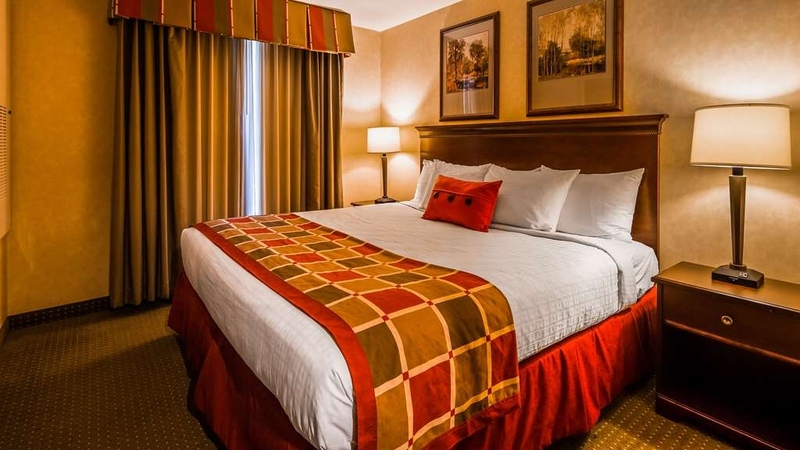 While not always consistent, I would say that Best Western hotels are typically decent, comfortable and affordable; with clean rooms, quality staff, and a good price. This one met all of my needs, and was a quiet and comfortable place to rest my head and shower the next morning. They had a good complimentary breakfast (bacon, eggs, bagels, waffles, fruit, etc). They also have an indoor swimming pool. The staff was courteous, and made sure I had everything I needed. Bathroom has soaps, shampoo, hair dryer, etc. as you might expect; also plenty of clean, fresh towels. My only critique would be that you could not close the "blackout curtains". Thus, there were only the "sheer" curtains that were closed. Not only do they not keep out the light, but on the ground floor anyone would be able to see through them if staring into your window. I found this to be really odd. In fairness, perhaps I was overlooking something at the window that would have remedied this. But I was too tired to care for very long. I had been driving for hours, and was just grateful to call it a night. Still, I think it's a great hotel and was quite pleased with my stay. The location was great as well. Recommended! Stayed 5 nights, used the pool, lounge and breakfast room. Had a wedding rehearsal in a function room. The service was very accomodating for 40 people. Would stay again. Access to the hotel was good. Beds were comfortable. "Comfortable and conveniently close to the fort"
Comfortable, clean room. Staff was very friendly. Breakfast at the Burgoyne Grill, which is in the motel, was good. Dinner options in the area are somewhat limited after 8pm, and the best restaurant currently open in the area (which is also open until 9) is the Burgoyne Grill. "Seeing son off to summer camp "
Just a few minor glitches with new staff - other than that- what a fabulous, easy going, responsive little spot. Rooms are a little noisy - on first floor at least, shower gets floor of bathroom all wet and slippery, but the in-house restaurant bar has genuinely great food. I will definitely stay there again when I am up there. Well worth it. Very economical as well. A little treasure. We were just passing through. Clean. AC works Great. The pool and hot tub are nice. The beds a pretty comfy. Pillows a little small. Breakfast was good. My only complaint is not enough plug ins. Would stay again. "A great hotel in Ticonderoga "
"Visiting the Fort? Stay here." Spent one night here in order to visit Fort Ticonderoga. Chose based on online reviews and are glad we did: not a lot of town here, and we decided to plan on dinner right here at the hotel. After a long history day, this was fine for us. Our room was very clean and comfortable (as we are used to Best Westerns being); the Grille was accommodating and easygoing. The food wasn't spectacular but neither were the prices; we knew what we were getting and were satisfied. We repaired to the "pub" (bar) for an after-dinner drink and were entirely comfortable. Nothing fancy here, but welcoming, clean and convenient. It was just right for our needs. Thanks! I hope that you enjoyed your visit to Fort Ticonderoga! They do an amazing job with their programs they have. I am glad to hear that you had a good experience with us. If you are ever in the area again I hope that you will stay with us! "Always comfortable at Times Best Western"
We stay at this hotel whenever we travel to Ticonderoga. As always the room is very comfortable and the staff is welcoming and courteous. The area around Ti is beautiful and the hotel is convenient to all roads. Thank you for being a loyal guest to us! 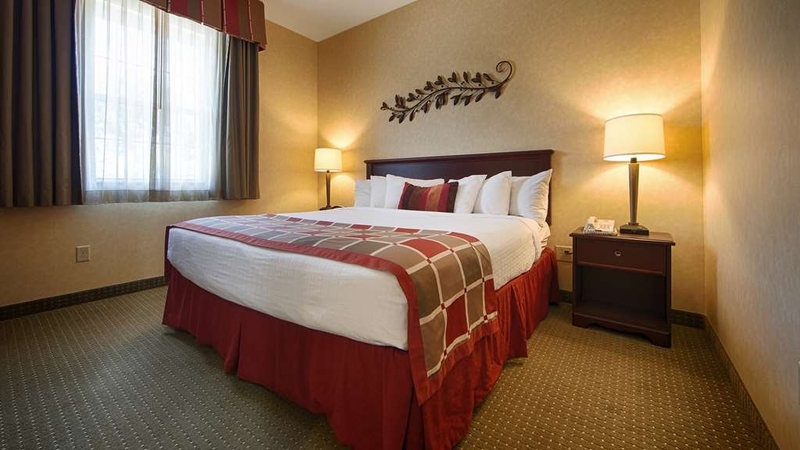 We appreciate that you always choose our hotel when you travel to Ticonderoga! Our staff works very hard to make sure everyone's stay with us is as enjoyable as possible and we appreciate your recognition of this! I hope you have a wonderful day! When we arrived the guest clerk was having a lovely conversation with another guest. When it was our turn, he became distracted and short with us. He kept answering the phone and finally waved us onward to our room while he was still talking on the phone. It is a small property so we could find the room on our own but I wonder if we should have gotten better service. ?!? I bought a Groupon to stay in their 'nicest' room. It was at the end of a hall surrounded by the stairwell to the second floor. We could hear every guest using the stairs. It was loud and annoying. If you are looking for an overnight, don't waste your money on the bigger room, I am sure the regular rooms away from the stairs will offer more rest. Probably the main problem is that we had just stayed in a Best Western in Vermont and had such an excellent experience all around. This hotel and room was supposed to be on par but was such a disappointment by comparison. We attempted to stay here on a Saturday night after my grandmothers memorial service. Didn't work out. We checked in late- the room was nice and clean. It was a long day so we changed and talked for a bit and wanted to eat before going to the pool. When we went down to the restaurant, we were told they had no seating and that we could "wait in our room and they will call when there are seats available". WHAT!!! We are paying to stay in this hotel and we were told we couldn't eat there!!! The front desk never told us we would need reservations, and the lady at the restaurant never offered take-out. Ticonderoga is not known for it's night life so we had no place else to go. After the day we had, we packed up and left. Didn't even get our money back. Horrible customer service. Thank you for your feedback, and we are sorry for your reason for staying with us. Although the restaurant is housed in the hotel, it is run separately from the hotel. We have taken your thoughts and concerns to heart; and changes have been made to ensure that this stays an isolated incident and doesn't happen again. If you ever come back into the area please call me, Allison, directly at 518-585-2378. Staff was super friendly and very helpful in helping me find a great deal on my room. Room was clean and decorated very nicely. Pool was nice. The restaurant had great food. Their chicken wings are excellent!! I am glad that our staff was able to help you find a great deal on a room! The pool is always a great spot to have fun. Were you able to relax in the hot tub? Wednesday's .50 cent Wing Night is the perfect time to get some wings! We hope that the next time you are in town you will choose to stay with us. I hope you have a wonderful day. Unfortunately, we were in town for a family funeral. The front desk staff allowed us to check in a few minutes early, which helped us get to the wake on time. Much appreciated! All the staff was very nice. We had a corner room on the second floor, which was very nice. Breakfast was great. If we are in the area again, we would definitely stay here again. We are very sorry for your loss.I am glad that we were able to get you checked in early so that you could make it to the wake on time. It's always good to start your day out right with a good breakfast. If you are able to stay with us again you should check out our restaurant we have on site. They have daily specials which are very tasty. I stayed at this hotel on Friday night, March 9 2018..I checked in late and was greeted by friendly staff...the room, a suite, was clean and comfortable..price was reasonable...I recommend this hotel for travelers to the Ticonderoga area. I am so glad to hear that you recommend us to other travelers! Our staff work very hard and we appreciate your recognition of this. We hope to see you again in the future. "A very nice get-away in a beautiful part of the country"
This hotel is ideal for families who simply want to get away and relax. We stayed here during the March school break and, as always, were very pleased with our choice of Best Western hotel. Good value, great breakfast and this hotel has an excellent restaurant on site. It's nice to hear that you were able to get away and relax at our hotel during your March school break. We hope that you will be able to come back again in the future! "Good rooms, courteous staff, breakfast can improve"
Rooms are spacious and very clean. One of the reasons we chose to stay at BW is good hot breakfast, but in this case it was a bit lacking, therefore took 1 star off It was standard BW breakfast with decent options but quality of ingredients was lacking. Coffee was too watery, waffle/pancake mix rubbery, eggs were ok. Thank you for letting us know about your breakfast experience. We always want to know what we can improve in. I am glad that you liked the room! We hope that you will come back again in the future! There is not much around this hotel. We stayed in the area because we have family close to this hotel. The hotel is very clean, has a great little pool and serves a great breakfast every morning. There is a Walmart and McDonalds close by. During the spring, summer, and fall we have Fort Ticonderoga which is a historical site that is a wonderful place visit and is only 5 minutes away. There is also the Star Trek Original set series which is right downtown. I am glad to hear that you thought we had a great breakfast. Were you able to try our homemade muffins? I hope that in the future if you are in Ticonderoga that you will consider staying with us again! I am glad to hear that you think our restaurant is the best restaurant in town! If you are ever in Ticonderoga again check out our Burgoyne Grill Facebook page for specials that are going on. We also do Tap Takeovers where we host a brewery with 5 select beers on tap to be sampled and prizes to be given away. Our next one is December 22 featuring Dogfish Head Brewery. Tap Takeovers are also posted on our Facebook site so if you can't make this one you can see when another one will be happening. We hope to see you again in the future! Beautiful hotel in the most beautiful place, The Adirondacks! Me and my family enjoyed our stay and definitely recommend this hotel to everyone. 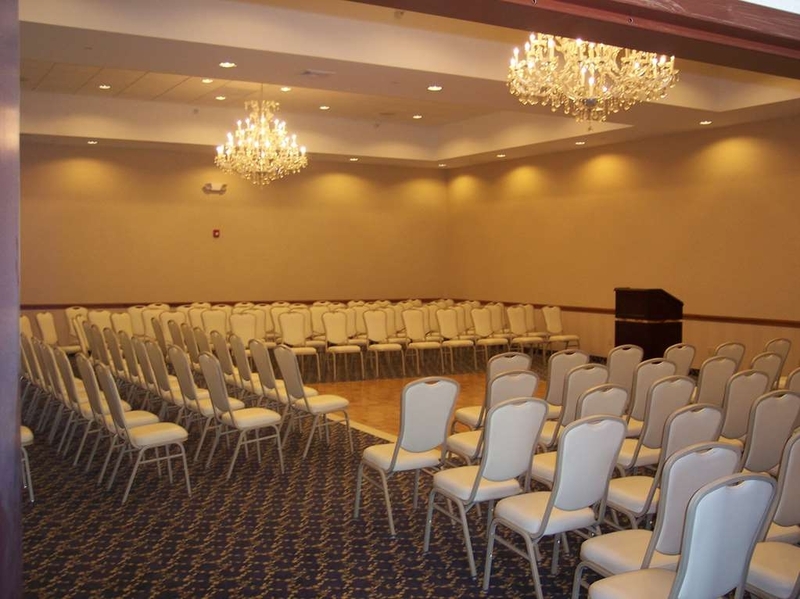 The rooms are spacious and the all around location was perfect. I recommend taking some time for yourself and visit the pool and spa. It wasn't crowded and the time we visited it was relaxing. This was the perfect family getaway! Our pool and spa is a nice place to relax while staying with us and I am glad that you got to take the time for yourself to enjoy it. I'm happy to hear that you would recommend our hotel to everyone! I hope that you and your family will be able to come back in the future! "A room, dinner and breakfast all in one"
Lovely property, clean, friendly staff, very nice well appointed room, and clean. We were tired after a long day of driving and touring and took advantage of the on site dining room. We were pleasantly surprised! I had GF pasta and meatballs with enough to take away for breakfast. Other diners had salads or steaks, all good. In the morning the continental breakfast included eggs. I noticed a coin operated laundry near the elevator. I am glad to hear that you thought our property was lovely! It's always nice to be able to sit down and relax after a long day of driving. If you are ever in town again you can check out our Facebook page for specials going on at the restaurant. This is a very nice hotel in the burbs of Ticonderoga. The staff were friendly, the room was clean and comfortable, the WiFi was speedy, and it's great to have a decent restaurant on site. To make it all the more appealing , our room was FREE because we had accumulated enough Best Western points to cover the tab. I am so glad to hear that you were able to redeem enough points that it covered the cost of the room for you! Our staff members work very hard to make everyone's stay as enjoyable as possible and we appreciation your recognition of this. Hopefully we'll see you again in the future. Fine hotel in good location. Rooms and decor a bit dated but it was clean and the beds were comfy. Food in the grill downstairs was better than I expected but the breakfast was very average. Friendly staff. Pool area/facilities very basic. I am glad to hear that you thought the beds were comfy and that the food in the grill was better than expected! I hope that you will be able to come back and stay with us again in the future! This is a nice hotel, well located to see the local sights. Our room was well equipped, though it smelled a bit odd, we thought it was probably slightly damp. The hotel has a very nice swimming pool and friendly staff. The Restaurant ( Burgoyne Grill) is very good, and we enjoyed one excellent meal there: however it was not open on the night we arrived (Sunday) which was disappointing, especially as there are very few alternatives in the area. Breakfast was OK - but hardly any food suitable for those requiring a gluten free diet. I am glad to hear that you got to enjoy our restaurant while you stayed with us. Thank you for letting us know that you didn't think there was enough gluten free items at breakfast. We will take getting some more gluten free item into consideration. I am sorry to hear that you thought the room smelled a bit odd, please always let the front desk know so that we can look into it for you. I hope that you will consider staying with us again in the future! "Room ok, noise and breakfast not ok."
A Greyhound bus pulled into the massive empty lot to the west of the Hotel at about 3:45 am and proceeded for several minutes to practice backing up to make sure the beeper was working...it was. The hotel should post signs in the lot prohibiting this. I do not believe the bus delivered any passengers to the hotel, maybe the driver was staying. Breakfast eggs and sausage were stone cold with no one in sight to replenish. There aren't many hotel choices in Ticonderoga, but this one was very good. The rooms were clean and the beds were comfortable. There is a restaurant that we ate at two nights and enjoyed both dinners. Breakfast was okay, but nothing special. I am glad to hear that you enjoyed both of your dinners that you had at our restaurant! I hope that if you are every in Ticonderoga in the future that you will stay with us again. "Clean, big room, friendly staff"
I stayed at this hotel recently for business. It was clean, the room was big, the staff was friendly, and the bar/restaurant downstairs was surprisingly good (even though it is only open from 4 to 9). I am glad to hear that the room was clean and big, that the staff was friendly, and that you thought the bar/restaurant was good! If you are able to visit us again in the future check out The Burgoyne Grill's Facebook page for specials going on. We went to see Ft. Ticonderoga and the hotel was confidently located. It was nice to ha e the lounge and restaurant right in the hotel. I did find the menu very limited it was pasta night and I don't eat carbs so my choice was very limited. I hope you had a fun time at Fort Ticonderoga! It's a wonderful historic place to visit. Thank you for your feedback about the menu during Pasta Night, we will definitely take that into consideration! Pleasant hotel excellent for mildew smell. Hard to sleep when pillows have such an awful smell. I was on the first floor so I don't know if it was throughout the whole hotel. It was damp and smelled. Restaurant was fantastic. I am sorry to hear that you had this experience with us! Please always contact the front desk so that they can help you have a better experience with us. I'm glad to hear that you thought the restaurant was fantastic. Our restaurant is always running specials so if you are ever in the area again you should stop by and check them out. "Nice stay and friendly staff"
Stayed Thursday night thru Sunday morning. Very attentive front desk and breakfast staff. Room service/cleaning could have been improved upon since they did not clean when asked (only asked for cleaning on 2nd day so we could have fresh towels). Wife he to go to housekeeping to get them since they never brought them. Overall, we enjoyed the stay and would visit them again. They had a good breakfast buffet. I am glad to hear that you thought our front desk and breakfast staff were very attentive. They work very hard and we appricate your recognition of this. I am very sorry to hear that your experience with housekeeping wasn't the best! We are glad to hear that overall you enjoyed your stay and that you would give us a second chance! I stayed a couple nights at the BW Ticonderoga. 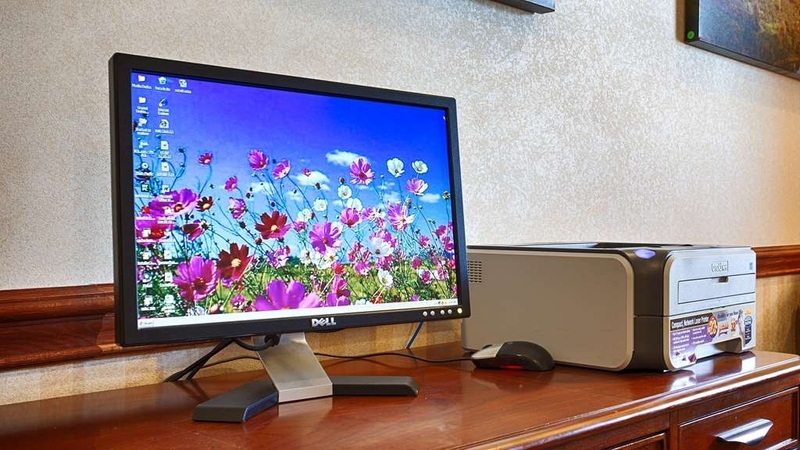 Everything about the experience was first rate: Friendly and helpful desk staff, very competent management, clean and nicely appointed room, plus a really quiet location. The restaurant was also excellent, with great food and outstanding wait staff. This is a well-run hotel and I will stay there again without hesitation. I am glad to hear that you had a first rate experience with us! All of our staff in every department work very hard to make everyone's stay as enjoyable as possible and we appreciation your recognition of this! If you stay in Ticonderoga, NY this is a great place to stay. The hotel has clean rooms, very comfortable beds and overall, a great atmosphere. I have never eaten at the restaurant, but it is always full of people. I have never been disappointed at this Best Western! I am gald to hear that you think our hotel has a great atmosphere! If you ever want to eat in the resaurant please make reservations so that you know you will have a table ready for you. The restraunt also has specials everyday so check out our Facebook page for those specials. I hope you come visit us again soon. Great room and front desk service. Food options at the restaurant are poor if you have a food allergy. As this is the best restaurant in town, it would really help if they could be more accommodating to food allergies. "Clean and convient for visiting Fort Ticonderoga." The room was comfortable, but not large. Maid service very helpful in supplying towels after the "too short shower curtain" left the floor wet. Employees friendly and helpful. Would avoid eating at the in-house restaurant again...not happy with our meal. However, they cheerfully took the price of my meal off the bill. Would certainly stay here again when visiting in the area. "Quiet, Slightly Isolated Hotel With Dining Facilities"
Our check-in got off to a rough start as the reception clerk told us that our reservation was on hold because they had called to verify our reservation and the person who had answered the phone had denied making the reservation. We are Best Western Rewards Platinum Members. They had our correct phone numbers and had obviously called the wrong number. We called the corporate number and were restored to our status. The rest of the stay went well. The room was adequate. We had dinner in their dining room as we didn't want to get back into the car to get food. There are no restaurants/fast food within easy walking distance. The dining room is decorated in a rustic theme. The service was good and the food adequate. It was quiet, so sleep was not hindered. A tour group was also staying at the hotel. It is located about 4-5 miles from Fort Ticonderoga so is a good option if you are visiting for that reason. "A Nice, Clean Quiet Hotel with Excellent Service"
Stayed for a night on a recent road trip. Staff was super friendly and attentive. Room was clean, as was the bathroom. The shower curtain was too short to reach the tub, so when you showered, the bathroom floor was slightly flooded, but were brought the issue to the management's attention and were told longer curtains were on order. The room did have a refrigerator if needed. Room was quiet even at the top of the stairs and near the elevator. Hotel had a nice fitness center, and an indoor pool. We ate at the hotel restaurant and it was very good (even though we were there on Wednesday wing night, and had to make a reservation and come back since it was so crowded). Breakfast is also served in the restaurant - just note that if you get there near the tail end of the breakfast service as we did, the scrambled eggs may be crispy & overcooked from sitting in the hot tray too long. Also, no decaf coffee was available at breakfast, and there was no attendant to ask if any was available. All-in-all, a very nice stay. The room was clean, and in order. Hotel staff helpful and restaurant staff helpful as well. Everything was pleasant for the stay. The restaurant was a nice surprise; food was good, a better value than expected. I was glad we didn't go into town to eat dinner, the meal we got at the restaurant was nice. "Quiet hotel until quiet hours not observed and door slamming at. Ugh you"
We stayed at the hotel for 4 nights. The first night there were no issues. Hotel was clean and maids friendly. Front office staff very bad with directions as well as took too long to check people in and it. 2nd night people opening and closing their doors of hotel at all hours as well as kids running up and down the hall and making all types of noise. Went to breakfast at least an hour before it was over every day and all syrup for waffles gone, waffle mix gone, scrambled eggs and ham or sausage not replenished as well. I requested if I could get some egg whites and was told I was not able to get them. Fruit as well gone. Hardly any other options to eat. If you want a decent breakfast you have to get up at 6:30am or go to Mcdonalds down the street. "Beautiful Hotel, but Can't Drink the Tap Water"
There is a tiny notice in between the doors stating their is a bacteria in the town water supply and that you should not drink the water. We were not informed of this upon checkin, I feel we should have been. Went out and got bottled water. 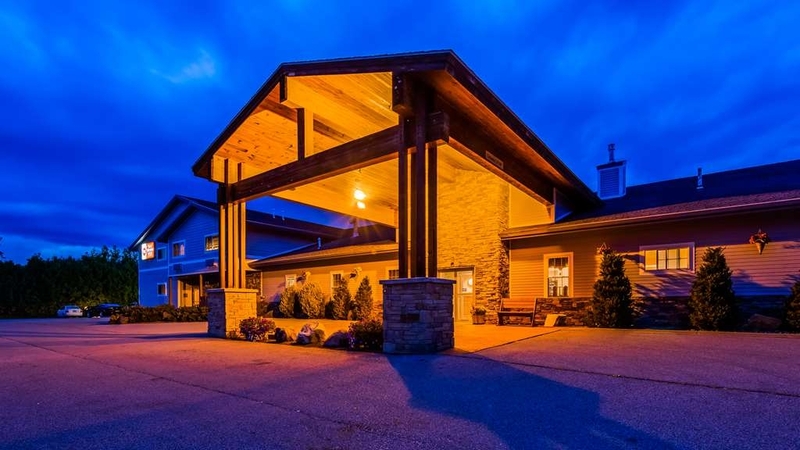 Our recent stay at the Best Western Plus in Ticonderoga, NY was outstanding! Clean, comfortable room, professional and caring staff and the food was delicious! Breakfast AND dinner. The location was beautiful and relaxing. The fitness room was well equipped. All of our requests were met with a smile. :) Thanks to ALL at this property! We have stayed at the Ticonderoga Best Western hotel a number of times and we have never been disappointed. Their staff and management are superior. 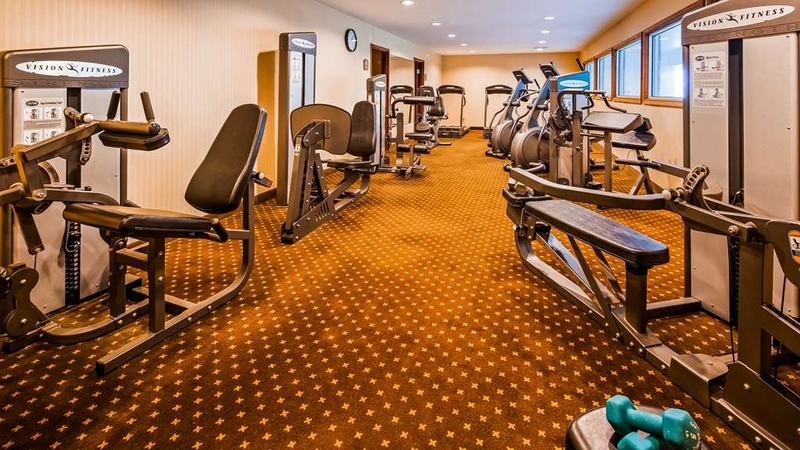 They have a top notch fitness center, better than most other hotels. We've enjoyed not only their breakfast, but have also relaxed over an excellent dinner meal as well. Whenever we are in this beautiful area, this is where we stay! This was the worst stay in a hotel I have ever had. At midnight the partiers returned to continue the party in the hallway. Many calls to the front desk. Confrontation with the said party by my husband resulted in being verbally abused by the party. The front desk clerk claimed the police had come however the party continued and they were never asked to leave. And apparently, according to the clerk, this was a repeat of the night prior! This place is a joke!! If your looking for a good party place well then stay here. If you want and enjoyable night away with a restful nights sleep, well you best keep looking cause it's not happening here! Thank you for your feedback. It is very much appreciated and we use this to ensure that future guests will have a better experience. The front desk undergoes training to deal with situations such as this however, it seems we fell short. Your comments will be discussed with the agents to help them better handle this type of situation in the future. Thank you again. "Very Convenient to many Adirondak attractions"
Minutes to Fort Ticonderoga. Spend the day there. The historical narrators are phenomenal. The Cafe at the fort is very good. Fresh veggies from the garden. Ferry and boat rides on Lake are available. The Best Western has an indoor pool and hot tub, plain but not crowded. Fort Ticonderoga is a wonderful place to spend the day. From walking around the Kings Gardens to the cannon shooting, and the fife and drum there is never a dull moment at the Fort. Were you able to go to Mount Defiance? 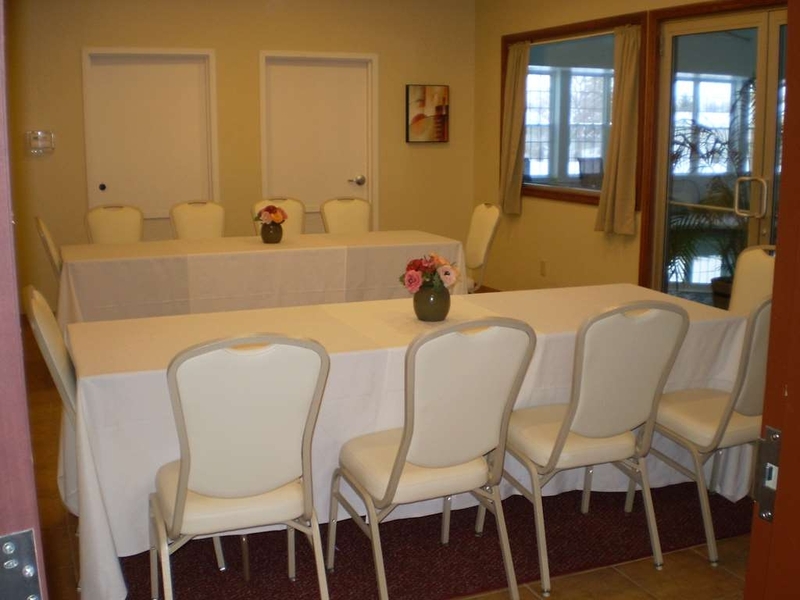 It has a beautiful view of Fort Ticonderoga, Lake Champlain, and the Vermont mountains. I am glad that you got a chance to check out our indoor pool and hot tub while you stayed with us. If you get a chance to come back and visit you should came during fall when the Fort has the corn maze, it a fun attraction they have every year. "Best Western In Ticonderoga, NY"
This hotel is the ONLY really nice place to stay in Ti. 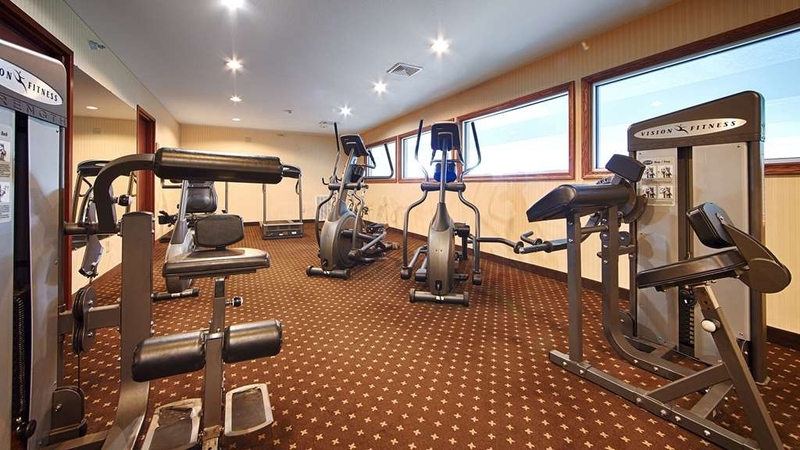 It comes highly recommended with all amenities: bar, lounge, restaurant, pool, fitness center, free breakfast buffet. The staff is very friendly and helpful. Rooms are very clean (no mold in bathroom tub yippee!) and nicely decorated. The hotel is off the main road and quiet but near to town, Walmart, etc. We have stayed here a number of times and highly recommend it to all. My three grandsons and I stayed here the day before going to Fort Ticonderoga. They needed to get rid of some energy after a long ride and the pool was perfect for that. The young woman who checked us in was very sweet and friendly. The room was clean and comfortable. I'd stay here again and would recommend it to anyone. "Comfortable Room, Above and Beyond Service"
We stayed here for one night, at the end of a family vacation. We booked the hotel at the last minute (that's how we roll), and got the last room available. Still, they were willing to give us a break on the room. The room itself was extremely comfortable. One of the nicest Best Western hotels I've ever stayed in. We ate dinner in the hotel restaurant. Food was great -- we were lucky, as there were really no other options in Ticonderoga. Pool was pleasant. Breakfast in the morning was good and fresh. All of the staff at the hotel, night shift and morning shift, were friendly and helpful. Would love to go back! My wife and I had two great days at the Best Western in Ticonderoga. We loved the location close to historical sites, and we found the room absolutely up to high standards. We had a superb meal at the hotel restaurant- reasonable prices, delicious food, and a great waitress. We would definitely use htis hotel again after our very positive two day experience. "improvements have been made since last stay"
Stayed for one night on a short vacation. The faculties were new and very clean. The room was very comfortable. The only downside is we arrived on a Sunday afternoon and the restaurant and pub were closed. Also the smoke detectors were both "chirping", just enough to be disturbing. We were offered a change of rooms and did so. New room not much better, no chirping but rattling air conditioner, not the normal sound of air blowing but the sound of sheet metal rattling. Hotel conveniently located for our stay while visiting friends. We were pleasantly surprised at the size of the rooms. The surrounding area is very picturesque. The hotel offered us just what we needed. Was at hotel for wedding of my daughter. Had over 25 guests stay there. The facilities are not super luxurious, the staff more than made up for it. The decor is kind of rustic. All King rooms are suites. Highly recommended for the Service. "Broken key readers - a dangerous situation"
Fully operational key readers on each room. When assigned a new key, on 8/6/17 (12:30am approximately), it did not work for my room entry (room 213). I spent the next 30 minutes traveling up and down from the front desk to room 213 with three additional sets of keys, and none worked. The fourth time, I asked that the front desk attendant accompany me to my room. His master key worked, but my key copies did not. He suggested I leave the security lock on the outside of the door, so that my room would stay ajar while I was at a friend's wedding event in the hotel. This was not a safe or responsible recommendation. I found it a frustrating experience, and missed a good portion of my friend's wedding reception trying to troubleshoot the issue. As a condolence, I was granted 10% off my second night's stay at the Best Western. I do not find this an acceptable solution, and request that the second night be wiped from my bill. This is a suitable option for a hotel that touts itself as award winning. In fact, I changed my reservation from a different local hotel to the best western because I was told the hotel was very accommodating and provided the highest level of service. Driving distance is close to the Fort. Swimming pool, breakfast, and dining room great for families. Friendly and helpful staff. We enjoyed our stay and would definitely use this hotel again. We had a 2-Queen Bed room. Everything was excellent. The room was clean and included a fridge and microwave. The fitness center was by far the most well equipped I have used. The breakfast was hot and delicious, and, the staff was helpful. "A plus but a minus on the breakfast"
There isn't much in Ticonderoga. This hotel is close to the fort.the rooms were very clean and comfortable. They are comfortable but there is no easy chair and not much extra space. 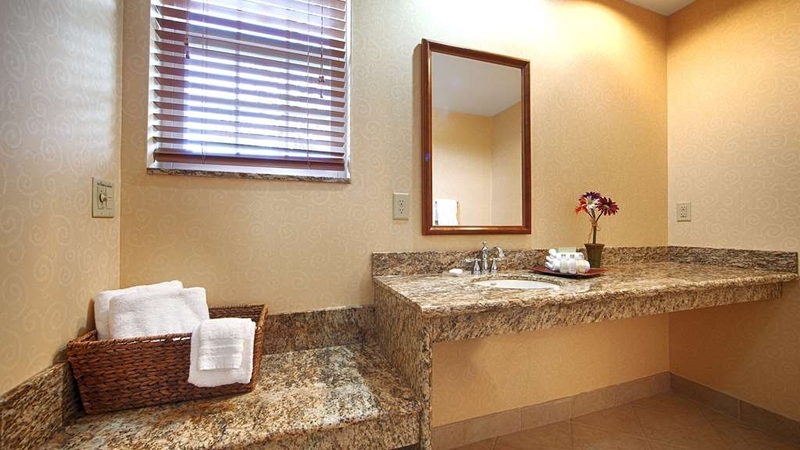 The bathroom was nicely done but again not roomy.They observe quiet hours, and it is in a more residential area so we heard no noise from the road or within the hotel.The staff was friendly except for the breakfast attendant. The breakfast bar needed more adult cereal, and a better layout. The waffle makers were in the middle and you had to step around people waiting for waffles to get to the eggs. On both days of our visit items were gone midway through the open hours. Naomi at the front desk was very helpful. Ticonderoga is a quaint little town, tuck away in New York. Friendly people, great service and great restaurants. Fort Ticonderoga was a neat place to visit, a little pricey, but worth it. The Best Western had the friendlies staff and the restaurant had the best food. My wife and I had a weekend getaway in Ticonderoga. The BW Plus is a very nice motel with large and very clean rooms. The staff are friendly and knowledgeable of the area. I was amazed at how quiet the motel was at night. The restaurant was excellent! Reasonable prices and great service. The food was very good with large portions. I would highly recommend staying and dining at this Best Western! Our family stayed at the BW Ticonderoga and planned on staying two nights. We were enjoying the sights and history around the area so much that we decided to stay a third night. We didn't look for another hotel because the BW made us feel at home. The room was clean, the beds nice and comfortable. The breakfast was delicious! And to top it off, the staff were friendly and helpful! Thanks Ti BW! Great spot in Ticonderoga! The hotel is clean and quiet. The restaurant within the hotel is convenient and good. The room was very clean. Check in was easy and the manager was very friendly and helpful. The parking area is large. All in all, it was a wonderful experience. Always use this Hotels for our CVMA trips.Weather it be here in Ticonderoga or in Plattsburgh NY.The staff are great,and very helpful.Like the fact that they have restaurant's and a great buffet breakfast .All the stuff u could possibly need to eat and more. A little pricy, but we had a delightful stay. We held a family reunion there, and the hotel was very accomodating. The food in their restaurant was excellent, and large portions. Only minutes away from Fort Ti and Mount Defiance. Surrounding area is breathtaking. The service was beyond hotel expectations! The staff was attentive, helpful & very friendly! The only complaint is the Internet was intermittent. However, we were told they would be upgrading it the Monday we were leaving, so it way not be a problem in the future. I would highly recommend this hotel! "AC broken, then came on with loud bang, no sleep"
Convenient, clean, well maintained, nice rooms, friendly staff, lots of parking. if you are going to visit Fort Ticonderoga, Crown Point and the surrounding area, this is a fine place to stay. Nothing fancy, but no surprises. "Great but make res if you want to eat there"
We made the reservation they are because we wanting to be not far from the fort. The rooms were very clean and the property also. Everyone was great with service however when we inquired about eating in the restaurant we were told that we should have a reservation. When we asked the host at the station at the restaurant he said they were Full because it was chicken wing night. I understand, but I think they should reserve some tables for people who come in to sleep there. We did not get there late – we arrived at around 5 o'clock at the hotel for check-in. We stayed at the hotel for two nights and noticed there was a dog in a nearby room. The first night wasn't terrible - it barked a few times. The second night was awful. The dog barked all night long. We got no sleep. I complained numerous times to the front desk but no one did anything. I will not stay there again. 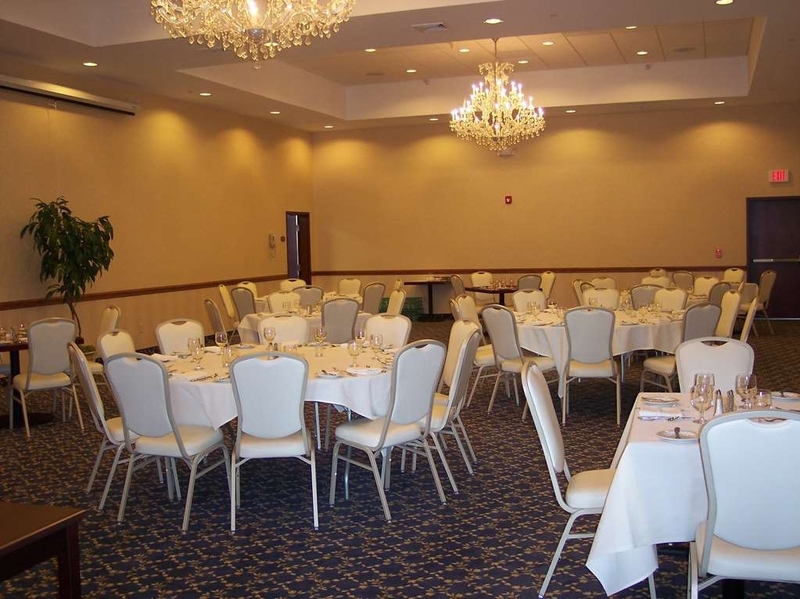 The room was very clean, staff was friendly and dining in the hotel was excellent. This hotel was off the main roads, yet was easy to find. Even though we stayed for only one night we enjoyed our stay. Stayed in a king suite for 3 nights over the July 4th holiday. Never did use the in-room hot tub nor the hotel pool and spa but all looked to be in working order. The room was large and comfortable. Plenty of room for both of us. Bed was very comfortable. Handy to have the microwave and refrigerator. Staff was very friendly upon check in and out. Loved the hot breakfast every day - eggs, waffles, pancakes, juices, pastries, yogurt, fruit, oatmeal. Also ate in the hotel restaurant (see separate review under Burgoyne Grill). Lots of parking. 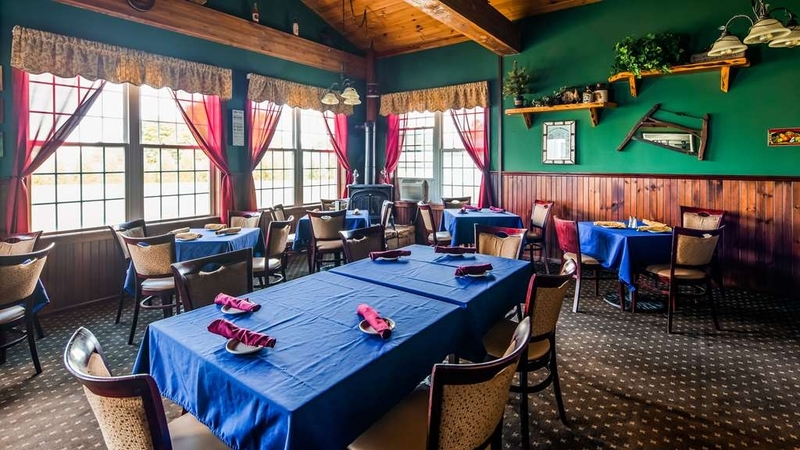 Convenient to Fort Ti (3-4 miles away) and downtown Ticonderoga (1-2 miles) where you can find other dining options. Just up the street from Walmart, Rite-aid, and a gas station. Highly recommend this hotel. Thank you for choosing to stay with us over the July 4th holiday! We are glad to hear you loved the breakfast! Next time you stay will have to check out the pool and spa, it's wonderful to be able to sit back and relax in the hot tub! "Fine option for a short stay"
The hotel was adequate. Room was decent and clean. Nicely redone bathroom, but unfortunately the shower had trouble draining so the water in the tub rose as you showered. We should have called the front desk but we were too tired. That's on us-so we just dealt with it for the length of our stay. Pool and hot tub area could use some work- peeling paint on walls near hot tub and entire area could use a facelift. Restaurant on site was a good choice for dinner. Free breakfast was ok. They seemed to have trouble keeping it stocked while we were there, but I believe it was a full house. Some of the hallways had a bit of a body odor/cleaning supplies odor for most of our stay. It wasn't very pleasant but it was not in the room thankfully. Cookies are out for a couple of hours in the evening at the front desk- nice touch! All together an ok stay, not top of the line, but is sufficient for the price. We are happy to hear that you got to enjoy the cookies the front desk staff puts out for the guests! Adding that homey touch to the hotel is something we love to do. We are sorry to hear that the shower was having trouble draining; next time please let the front desk know so maintenance can fix it for you and you can have a more enjoyable stay. Thank you for your recommendation for the pool and hot tub area, we have a total revamp scheduled for fall. Check out our Facebook page and see what specials we have at the restaurant! Overall I thought the hotel was very good. Reasonably priced restaurant attached to the hotel. Rooms were nice. The pool surface needs to be redone though - brushing up against the side of it scraped 3 of my daughters toes. We were in Ticonderoga for a family wedding. Several of us stayed here.We all were very satisfied with this hotel. Our family had four rooms. Friends had a fifth room. We were able to eat breakfast together. After we ate we were able to sit and visit. The pool is nice little pool. "Good option for the area"
The hotel was very clean, which I always think is the most important thing. The location was convenient, it was a short drive or walk to places to eat and Rite Aid and Walmart. The beds were rather hard, and the internet was spotty. I love that the windows actually open. Bed was comfortable, room clean, but linens did not appear clean and white as they certainly could be. A bit pricey for the experience, but overall a decent value. It was quieter than was anticipated especially for a busy weekend. "Good place in the middle of a country setting." This Best Western is the only one I have been to that us really in the middle of nothing, country setting. It was clean and well- appointed. The breakfast was good, not great. The restaurant was ok, not great. "Poor quality furnishings and facility issues"
Beware of relying on rooms advertised with a sofa bed. We rented a number of rooms and everyone using them had the same opinion. We did not expect the same quality sleep as with a complete bed but these sofas a the lowest quality. I literally slept on the floor on the final night. Staff were super friendly, professional and helpful. The list of facility issues included little to no wall insulation between rooms, overflowing trash at the building exits, slow bathroom sink drain, non-operating gas fireplace, and broken/slow toasters at breakfast. We were there for a family wedding. Our room was ready for an early check in as requested. The rooms were clean, and the staff was friendly. We used the whirlpool (which could have been a little warmer), but was relaxing nonetheless. The drinks were a little overpriced in my opinion. Overall, an excellent hotel for the money. "Not terrible, but could have been better!" Front desk staff was friendly and attentive, but not completely informed. Restaurant and lounge staff were friendly, but service was slow. Attended a wedding for about 165 patrons and the main course took over 1 hour to serve. Head table was finished with meal before 2/3 of room even received meals. Seemed like kitchen was slow putting meals out as they were coming one and two plates at a time. Thank you for staying with us. I apologize for the slower service with not only the restaurant but the wedding as well. I know that with a platted dinner it does take a few extra minutes to put out dinner, and am sorry that you felt it was slow. Hopefully you did enjoy your meals and I heard the wedding was beautiful!! Thanks again for staying with us and hopefully you will stay with us again next time you are in the area! We stayed one night at the Best Western Plus in Ticonderoga, NY. It was a family trip with four of us in a room with 2 Queens. The room we had was a corner room just inside one of the entrances. The room had windows on two walls which gave the room more sunlight than a normal room. We did not utilize the pool, hot tub or fitness room, but they all seemed very nice. There was a guest laundry, which I appreciate on long trips. The breakfast was fine and served in the hotel's restaurant. It was nice to have a restaurant on the premises and to be able to have a drink without leaving the hotel. The staff was very nice, both at the front desk and at the breakfast. I appreciated the clean and comfortable stay at the BW Plus Ticonderoga! Thank you for choosing us to vacation with your family. Across the board the staff tries their best to accommodate and excel in their department. Glad to see you enjoyed breakfast, and hopefully next time you are in the area you will stay with us and check out the pool or hot tub!! Have a great summer! This nice, safe, reasonable hotel is easily located off the highway! It does have an on-site restaurant and offers a free breakfast. You can easily drive/walk to MacDonald's, Dunkin Donuts, Subway & WalMart. Ft Ticonderoga & Crown Point,are popular historic sites which are a short drive from the hotel. Everything you need is close by! Hope you enjoy your stay! Thanks so much for staying with us. Fort Ticonderoga is a great attraction for our area and being only 5 minutes away we hope all guests check it out! Next time you come you'll have to take a day trip to Vermont, there are so many historical places and only a 15 minute drive to the bridge over! A clean tidy establishment with unusually loud late night lodgers. Complimentary breakfast was adequately diverse but hot foods were dry and only warm. Convenient to our trip, but were we not so road tired, we would have sought as less overpriced option. We apologize for the noise problems you experienced. In the future if you ever have this problem please alert the front desk, and they will take care of it for you. Hopefully you enjoyed the rest of your trip and our bestwestern.com site offers a lot of discounts so check them out next time. Thanks for staying!! 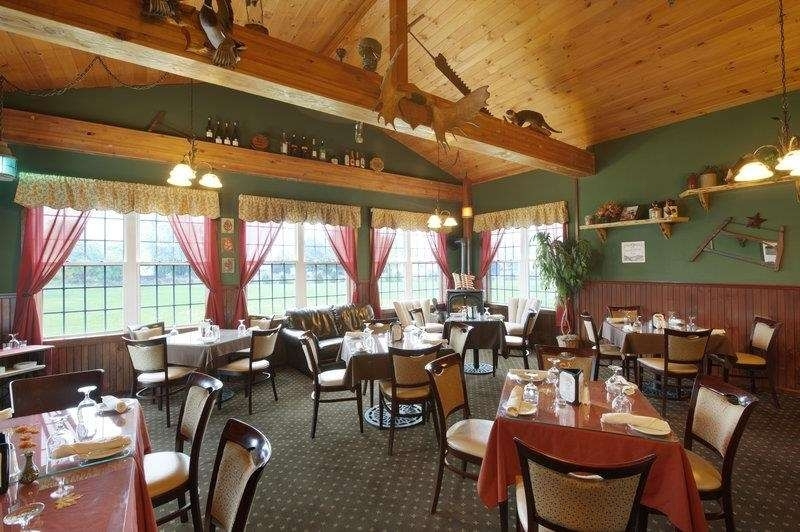 "Great for the price "
Stayed here September 2015... my husband (boyfriend) at the time live in the glens falls area and wanted to go to Fort Ticonderoga for the day... we realized how inexpensive the Best Western was and stayed overnight instead. For $20 more we got a suite room with a hot tub! It was clean and decent breakfast. Thanks for staying with us and so glad you enjoyed the Fort. If you ever come again in the fall you will have to check out the corn maze they do, it is so much fun!! Check our facebook page in the fall and winter months as we run specials on our VIP King Suites, nothing is more relaxing that sitting in the hot tub with a hot cocoa watching the snow fall outside the window! I travel a great deal for business, and this is one of the friendliest hotels I have stayed at. Check-in and check-out staff were friendly and helpful. 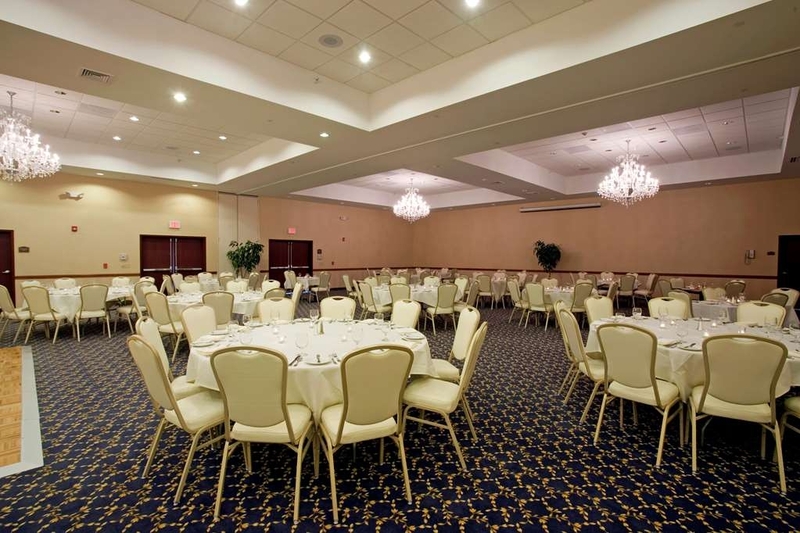 Great to have an on-site restaurant, pool and fitness center. All in All a very good experience. Hotel and staff are top notch. We had a wonderful stay there. The staff as well as management are professional and very hard working group who want your visit to be as comfortable and enjoyable as possible. The area is beautiful and we visit often. Live our stay there! "Room was for sleep only, not interested in free breakfast"
I have stayed at this hotel several times in the past 3 years. The facility has always been very clean and the service excellent. I Used to live just down street from this hotel and dined often at their facility. The bar prices were very reasonable. However in the past year, the mattresses were changed into the hardest surface I have ever slept on, and the pillows were replaced with something the size of a small throw pillow. From a welcoming and helpful front desk staff to each employee we met during our stay, they were all very professional and wanted to make sure our stay was a happy one. The hotel/rooms are all very clean and comfortable with a good, warm breakfast as an extra bonus! We had a great visit here and will make sure this is on our stop list in the future. It was excellent. Clean room, nice clean modern lobby, clean pool, everything was A+ I was very happy with the accommodations. There were very little hotels in the areas so I was nervous about finding one that was clean and modern... unlike the nearby motels. If you're looking for a clean affordable place to stay in the Northern Adirondack area - this is it.We have stayed at this Best Western multiple times over the past year. The rooms are exceptionally clean and well maintained. Breakfast staff is very accommodating. "Overall nice place to stay"
Overall, I was very happy with this hotel. The property was very clean. The room was very comfortable. I really liked the beds. The sheets and blankets did not shift or move at all during the night. The restaurant on site was decent. The atmosphere was nice and the staff was attentive. The food was somewhere in the middle. The areas I was disappointed in was the hot tub and the distance the property was from our event. The pool area was really small and the hot tub was cold. A bath in my room would've been warmer. The other issue was distance from our event and I'm not sure of whose issue it is, the hotel or Expedia. I booked this hotel because it was supposedly 16 miles away from where we needed to be. The actual distance was more than twice that, which translated into a 50 minute ride each way from hotel to event. I would not have stayed at this property if the distance from our location was accurately disclosed. The purpose of staying in a hotel was to be close to our event and it wasn't remotely close to it. If your destination is Ticonderoga, this is a good place. Otherwise, you're in for tedious single lane roads to get anywhere. Quiet, clean and comfortable. For an overnight trip to Ticonderoga I booked this hotel. The rooms are nice and very new. I liked the soap (funny, but I noticed the aroma of this soap). The heater and A/C had an odd quirk +/- 2 degrees at a time. The bath towels were below par, not very big and a bit worn. The staff both at the desk and at the restaurant was pleasant and attentive. The main dining room is cramped, perhaps moving out a table or two might help. But this hotel was a pleasant surprise and I'd recommend it. On a road trip north and over the border, my DH and I stayed at four different brands of hotels. There were not many choices for a hotel/motel accessible to Fort Ticonderoga; hence, our stay for one night at Best Western. While my bare feet never touch a carpet, my husband opts for the opposite. So he provides a test as to which accommodation has a carpet overdue for cleaning and the hands down winner is Best Western. Please, management: clean the filthy carpet!! We stayed at the Best Western in Ticonderoga,NY. The room was great. Loved having a king size bed and a sitting room with a fold out couch. Its my home town and it was wonderful visiting there again and having such a nice place to stay while there. Totally wonderful place to stay.Lived it. We were traveling all day and did not get to the restaurant until 8:30 -- and we didn't have dinner. It was sooooo...nice that there was a restaurant on property and it was open. The wait staff was awesome and the food was good! The room was very clean, the bed comfortable and breakfast was included. It was a great stay! I would definitely recommend this hotel and stay here again. We stayed at the hotel for the first night of our New England vacation. We got there around 8:30 pm. and they had our paperwork all ready and waiting. Check in was easy and fast. We asked for food recomendations and the girl at the front desk was very helpful. Room was very clean and had everything we needed. Internet worked fine. We had breakfast the next morning and it was very good, nice selection, fresh fruit cut up in cups. The staff in the dining area were very nice, they were closing up and she offered to go get us more coffee out of the kitchen. There are no signs on the main road which makes it hard to find hotel, but other than that it is great. "Best Place to Stay Near Fort Ticonderoga"
An older hotel but very clean staff was very helpful not much to do in town other than fort Ticonderoga which was a nice tour. Restaurant was closed the night of our visit which was unfortunate. We ate at the nearby wagon wheel which was absolutely awful . I shared a room here with my father. We were given a room with plenty of space for us to comfortably spread out in. When we checked in the clerk has very friendly at efficient. She was also helpful in answering our questions about the area. The two breakfasts we were there for we found the food was well stocked by the nice woman working there. She also kept the eating area clean. The property is very clean and well maintained. There was an acceptably minimal amount of noise from the other guests while in the hallway. The property is located in a quiet neighborhood away from but not far from the highway and downtown Ticonderoga. There were two desk chairs in the room. It would have been nice to have more of a comfortable easy chair as well. The workout room has enough equipment in good repair to have a decent workout. Just the place to settle in for the night. Staff extremely helpful and friendly. Bed high quality and comfortable. Restaurant on site. Location convenient to the historical sites and lake, and not a lot of options, so the fact that they work to fulfill needs in a situation where they are not facing enormous competition is very pleasing. We chose this hotel for the convenience to the Fort, and we were glad that we did. The staff was friendly, the rooms were clean and the breakfast was good. We ate at the restaurant in the hotel both nights there, the food was very good. Would stay again if in the area. This motel was surprisingly excellent. Although some of the reviews didn't rate it very highly, we found it clean, well-managed, friendly, helpful staff and had an excellent dinner in their restaurant (crab-stuffed sole). The rooms are large, clean and the beds were wonderful to sleep in. We want to especially acknowledge the front desk staff of Jean and Sara who were exceptionally helpful. You won't be sorry you stayed here and thanks for your service and friendliness. "So happy to find this hotel"
We were so tired after a full day of forts, monuments & battlefields. So happy too to have a lovely restaurant & bar included in the facility. The room was nice & clean. Comfortable beds & very quiet. The drinks, dinner & breakfast were excellent. Thank you for making a wonderful end to our weary day. 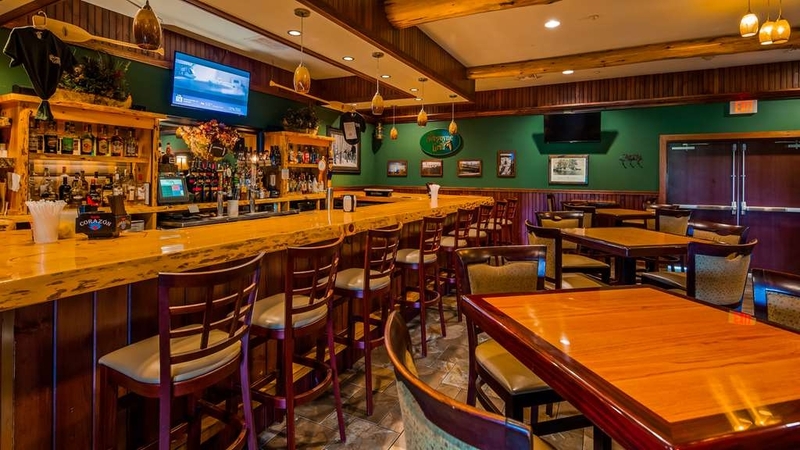 So glad you enjoyed the restaurant and bar, and tried one of our local brews we have on tap! After a long day, I am sure all you needed was a warm meal and to relax, and I am so happy to hear we were able provide all of that! If you come back this fall to check out the Fort again, make sure to try one of our delicious new Fall Menu items, they look super yummy!! An excellent choice if you want to stay close to Fort Ticonderoga. Approx 2-3 miles from the Fort and Mt Defiance. plus relatively close to Schrooon Lake approx. 18 miles. Very Good restaurant & bar which unfortunately was closed Sunday afternoon & evening. Friendly staff & comfortable room. Thanks so much for staying with us. We are really close to the Fort, and are so lucky to have such a great relationship with them! Hopefully when you checked in someone told you about the tickets we sell and gave you some general information about what was going on there! Unfortunately we close the restaurant in the beginning of September on Sundays, but hopefully we were able to recommend a couple of great places in town like; Emeralds at the Country Club, Libby's Bakery, or Bodette's BBQ. "Very nice accomodations. Would definitely recommend." We were on vacation, celebrating my husband's birthday and chose an upgraded room with fireplace and Jacuzzi. We were not disappointed. The room was spacious and attractive. The living area was separate from the bedroom. We had a refrigerator and microwave as well. Staff was friendly and all common areas of the hotel were nicely cared for, as was our room. Happy Belated Birthday to your husband and SO glad he enjoyed himself here with us! 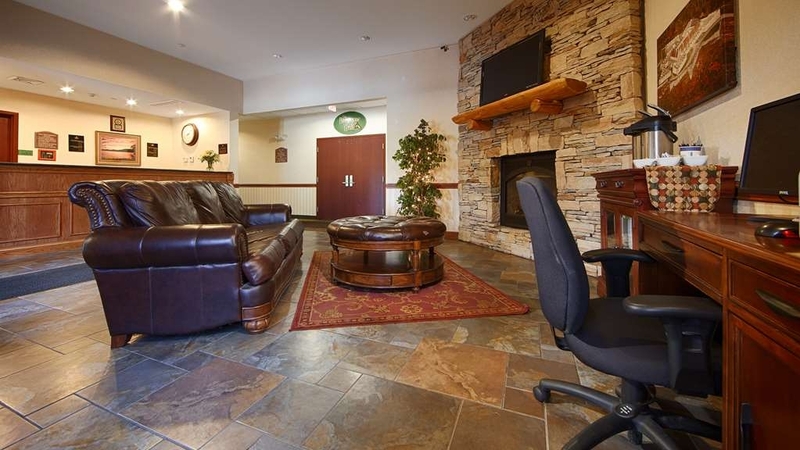 Our VIPKS are really fantastic rooms, the fireplace and hot tub really adds so much. If you ever get the chance to come back and stay with us in the winter, those rooms are even more popular with the snow falling. We put hot cocoa for the keurig in the rooms and nothing beats curling up on our couch in front of the fire with a cup of cocoa :) Thanks for staying with us again and hope to see you again. "Only choice in the immediate area"
It's an average hotel. Restaurant low rated. Breakfast fine, but needs fruit. Nice indoor pool and hot tub. Near center of town. Price is rather high, but like I said, it's the only decent choice in town. No comfortable chair in 2 queen bed room. Thank you for staying with us and for your comments. I am sorry that our breakfast didn't satisfy you. We normally offer three fresh fruits, apples, oranges, and banana's. Glad to see you enjoyed the pool and hot tub! Have a good rest of the fall! "Great accommodation and dinner. Avoid breakfast." As the title suggests. I had a very relaxed stay. Good service, lovely meal in the evening. Then I had this....car crash of a 'breakfast'. It was thoroughly unpalatable with what appeared to be the cheapest of ingredients. I couldn't finish one item on offer, neither food nor drink. Thank you for your review and for staying with us. I am very sorry you didn't have a good experience at breakfast with us. We make fresh scrambled eggs and sausage along with homemade muffins and much more. I will be speaking with our breakfast staff about your experience so this isn't something that our guests experience again. Hope you have a good rest of the fall, and thanks again for staying with us. We did not stay here, just ate dinner. It was getting dark after a long driving day, and we had to to get to our BnB in Hague, and we were too hungry to wait. This place was surprisingly good for a roadside motel restaurant. I had a delicious burger, and my husband had red snapper. Bar prices were reasonable. Thanks for having dinner here and so glad you enjoyed! The Red Snapper is a new special for us and has been going over so well! It is really a delicious dish. Hope you had a good stay at the B&B, and we'd love for you to stay with us next time. Our phone number is 518-585-2378. Stayed here for a wedding in the area. The staff was amazing - so quick, efficient and friendly and they tolerated our flip-flopping reservations like true professionals. They were such a pleasure! Can't speak to the restaurant but the rest of the hotel was very basic. While my room was damp and musty, the bathroom and bed linens were clean and housekeeping was excellent. There aren't a lot of hotel (not an inn or B&B) options in this area so this is adequate. "Great stay & Nice area!" Great stay and a very nice area to visit, very pleasant locals. Hotel was in very good condition and overall cleanliness was very good. Price was within average for this area. I would have liked to give an Excellent but I was disappointed that some of the breakfast items were cold and there was no microwave in the room or the breakfast area. Also I was a little irked to find an amount larger then the original booked price was charged to my card without my knowledge which then was automatically adjusted in a few days. Since I wasn't familiar with this practice I had to call and the Hotel explained it to me, but why they do that was not explained. I guess it's in case you smoked or farted too much in the room they charge you a surcharge to fumigate the room. Also if you stay there make sure to visit the Hot Biscuit Diner. The food was good & plenty & the prices very fair. Also very respectful & heard working people here & all around the Ticonderoga area. Thank you for staying with us and we are so glad you had such a great visit. In regards to breakfast I am sorry you were not made aware of the microwave we have right in our lobby for use during breakfast. The hot biscuit diner is very good, I personally love their egg salad for lunch. So glad you were able to enjoy some of our local restaurants. Next time you come you will have to check out Libby's bakery in town, they are really one of my favorite places!! Have a great rest of your summer and hopefully next time you are in our area, you will stay with us again. we were there early but was able to check right in our r room . check in was quick and easy .Friendly Service ,Breakfast was set up hot and good .This hotel is close to a lot of Historical Sites , a local walmarts is just down the hill . I am glad we were able to check you in early, and you had a good stay! The Fort which is our big attraction in town is located just about 5 minutes from the hotel and is fantastic. We recommend it to each and every one of our guests, hope you were able to enjoy a day there. Thanks again for staying with us and have a great rest of your summer! Thank you so much for your response, and we are very glad you enjoyed your stay! We are proud to be a family run business, and the family has devoted a lot of time and effort to get the grounds really up to the standard of the rest of the hotel this summer. We really appreciate you noticing and I will make mention to the clan. Thanks again and hope to see you again next time you come to Ticonderoga! We spent a night there during a visit to the fort. Nice room, clean but basic. Only a couple of miles from the fort. This hotel also has a decent restaurant. The included breakfast could have been but you get what you pay for. Gym and indoor pools are a nice bonus. Thank you for staying with us, and glad to hear you took advantage of our gym and pool. We pride ourselves on having clean rooms. We will take your comments about breakfast as a possible area of improvement and will continue to work on implementing changes! Thanks again! Though not conveniently located within walking distance to pretty much anything, this hotel was very nice for our two-night stay. It is about a 30 minute drive to Silver Bay, and only about a 6 or 7 minute drive to Fort Ticonderoga. The hotel seemed very clean and relatively new. They have an in-house restaurant that serves basic pub food. The included breakfast is your standard Best Western breakfast fare, waffles, scrambled eggs, sausage, donuts, bagels, yogurt, cereal, fruit, etc. There was a pool/hot tub but we didn't end up using it. There is ample parking in the lot. Thanks for staying with us and hope you had a good time exploring the Fort as well! The Fort has so many great programs this summer and fall hopefully you were able to take advantage of some of them. We also sell discounted tickets at the desk so hopefully you were able to take advantage of that as well! "Fine Option if you need to be in that specific Area"
We have stayed at this hotel yearly because we pick up our son at camp in Paradox, NY. The camp is 20 min away which is why we choose this hotel. The hotel is fine for one night. The staff are very nice and the hotel is clean and the beds comfortable, although the pillows could be more comfortable. The breakfast is good for this class of hotel. I must say I have on occasion stayed at other Best Westerns and this is the best that I have stayed in. "Great Hotel in Lake Champlain Area"
We enjoyed our stay here, convenient location for our trip to Ft. Ticonderoga. The staff are cordial and helpful. Our grandchildren especially enjoyed the pool and the make your own waffles at breakfast. Nice hotel. Good value. Easy parking & check-in/out. Quiet area. Good restaurant. Room had a musty smell but overall clean. Wireless signal in room is very weak. Otherwise good place to stay for a few days. 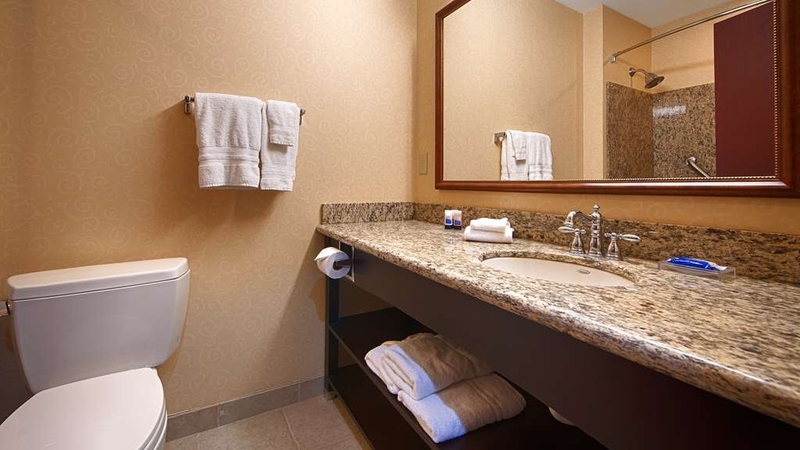 Suite is convenient for in room privacy. Roll out couch for kids/family to sleep on with separate TV. Very nice overall. "Clean, quiet, well run. Very friendly staff." I stayed at this hotel recently during a conference. I found it very well run. The staff was polite and friendly. The rooms and public areas were clean. It was very quiet at night with a quiet policy notice in the hallways. The breakfast had a good variety of hot and cold choices. The coffee was very good. I will stay here when I return to this area. Terrific hotel - good clean rooms and good feelings all around. Nice continental breakfast in morning and good restuarant for dinner. Maid service top notch. For business or please trip you cant go wrong. Staff was extremely friendly and helpful. The hotel was in a convenient location and very clean and modern. The wi-fi worked very well, and we took advantage of the free breakfast which offered a good variety of items. I highly recommend this hotel. 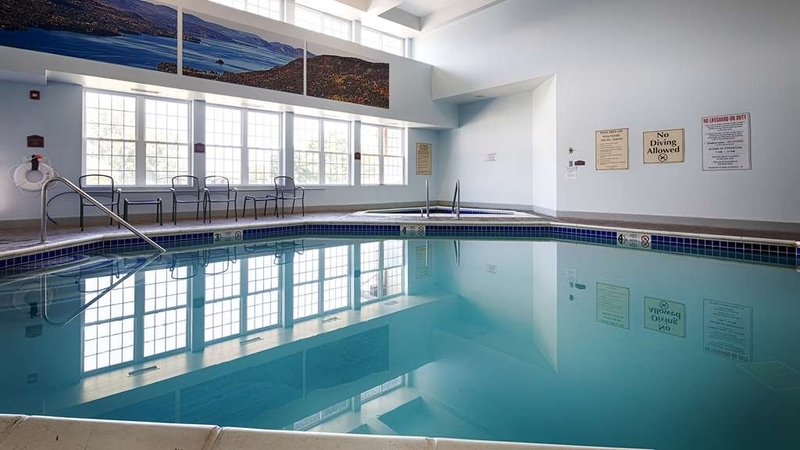 My family and I recently stayed at the Best Western and considering we did not know the area we were very happy to have the pool to entertain our kids, the free breakfast and the restaurant at night for dinner. This was a great plus so we didn't have to go searching for a place to eat. The beds were comfortable and we were happy to get connecting rooms. We have a family of six so we are unable to be in just one room. My parents also came and we were happy that the Hotel honored our request in keeping their room near our room. We were all there to attend a wedding at Crown Point, NY that weekend. Everything worked well and was clean. We would all stay again! Thank you! Our reason for coming was for a wedding on Saturday and we stayed an extra night to be a tourist. The check in and out went very smoothly. We opted for express check out and had our receipt emailed to us and it was promptly sent. Used the pool and the fitness center and both were good. Though the price was a little on the high side very thing about our stay was enjoyable and we have no complaints. We'd been traveling for three weeks and the fort was our last site. Since we were traveling with our dog we needed to stay at a Best Western. What a perfect place to end our travels. Everything was convenient. Parking. Breakfast. Ice machine. Front desk folks were lovely toward our dog. The owner's parents were trimming the bushes and gave me the cedar! It's very close to the fort, and in a quiet neighborhood. We would return and hope only the best for the owners. "Nice hotel in a nice area"
Last minute decision to stay here rather than driving at night. I received good service and with a CAA discount as well as an additional discount for having used Best Western in the past. Nice hotel and helpful and friendly staff but there is always room for improvement. The desk clerks friendly, efficient, courteous. Rooms clean, roomy, well maintained. The hotel is convenient to local sites. Breakfast well done, fresh fruit, juices, yogurt, waffles and pancakes, eggs and sausage complimentary. Very convenient. Spa, pool inside, exercise room available. We stayed with our grandchildren, 9 and 11. The motel is friendly and quiet. The kids loved the pool and hot tub. The free breakfast is ample and served in the bar area but we ate in the restaurant area. It is clean and a good value. close to fort. Make sure you have good directions as it is on hill kind of out of the way. We also enjoyed the dinner on site in the north county theme dining room. Be aware! I left something valuable in the room when I checked out and it was never returned to me. First reception told me it was found so I got organized to go back to the hotel to get it. Soon after the manager sent me an email to say that nothing was found in my room. When I called the manager was rude and very protective of her quite obviously dishonest staff. Something similar happened to me not long ago in another hotel and everyone went out of their way to return the item I forgot... Also, stay away from the restaurant. Food is bad. Breakfast is below average. Hi Elena, Thank you for taking the time to review our hotel on TripAdvisor. We value all of our guest's comments, positive or negative, so that we can continue to make improvements to our hotel. Our hotel and its staff is dedicated to maintaining the highest standards of service. We do take all matters of this nature very seriously. As you know, we did check your room both times that you inquired about your lost earrings. Unfortunately, we did not recover any lost items from your room. If you would like to contact us again, we are happy to put you in touch with the proper authorities to report your lost items. Our phone number is 518-585-2378. We also appreciate your feedback about our restaurant. Our goal is to provide a fresh variety of breakfast items that appeal to all of our guests. We are always working to improve our guest experience and will assuredly take your feedback into consideration for future enhancements to our breakfast offerings. Older motel with smaller rooms that were clean and remodeled. No dedicated phone and computer plug ins. Had to hunt for wall outlets. Older television. Very small breakfast offerings compared to other motel chains. We went to the nearby McDonalds and Dunkin donuts for more. 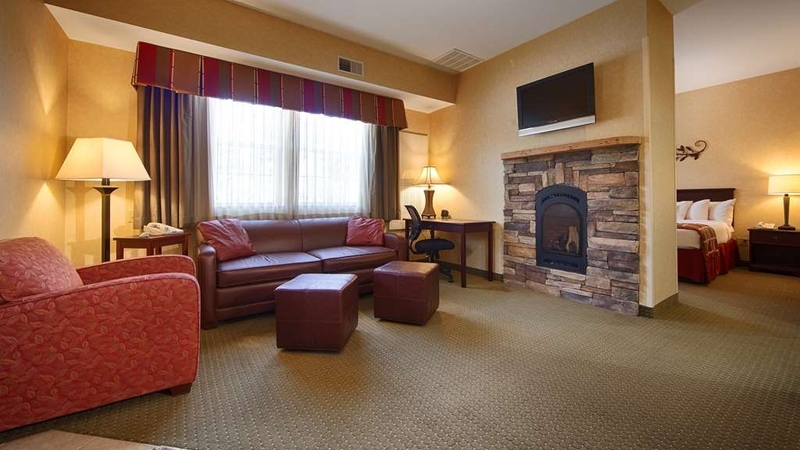 Beautiful and comfortable king suite with fireplace and refrigerator and microwave. Very friendly and helpful staff. Very clean. Nice breakfast buffet and full service restaurant. Pool and hot tub. Stayed for two weeks on business. Ticonderoga is a beautiful small town that emerges from the mountains and is larger than the surrounding areas due to the tourist attraction. The lobby was small but nice and included a couch and TV along with a old PC. The front desk was very nice and helpful in check in and even allowed us to check in about two hours earlier. We has purchased a suite with a king bed. The room was very spacious The bed was comfortable and the couch was as well. The room had a microwave,refrigerator, and a coffee/tea maker. The television had limited TV stations with maybe 20 stations in SD. The WIFI was adequate and fast but the Ethernet was extremely fast. The breakfast was great and had plenty of options. The restaurant had excellent food for dinner but service was extremely slow and seemed disorganized. All in all the hotel was excellent and I would recommend it to anyone. "Nice rooms- clean great restaurant "
A last minute trip to the area and got the last room. A bit high, but was ok, close to the Fort and nearby family Friendly staff. Quite new. Hot tub and pool functioning, which is always nice. Seems like locals come here regularly. That must say somethings good about the restaurant. The hotel in of few in the area. Very nice accommodation even though not much competition. Would definitely stay there again if I wanted to stay at a hotel in the area. The only other place I would stay is a rental cabin or home in the area. The breakfast can be slightly improved. Staff was very friendly and responsive. Fort Ticonderoga is a major landmark in the area and is supprising that such few people are aware. Fort Ticonderoga is indeed our major attraction for the area and we are so happy to have such a great relationship with them. Thanks so much for staying with us and great to hear our staff impressed yet again!! We are always working on improving areas that need attention and breakfast seems to be one of those. Thanks for the feedback and hopefully next time you stay with us, you will enjoy our additions to breakfast. My wife and I decided to take a "magical mystery tour from the head-waters of the Hudson River to NYC. We started at Lake Champlain, NY side at Plattsburgh, NY and stopped at Best Westerns along the way down the Hudson River Valley; Ticonderoga, Saratoga Springs, Poughkeepsee and Tarrytown/Sleepy Hallow. You ever want to see upstate New York make sure FDR & Elanor's Hyde Park, West Point and Washington Irving's estate are on your agenda. 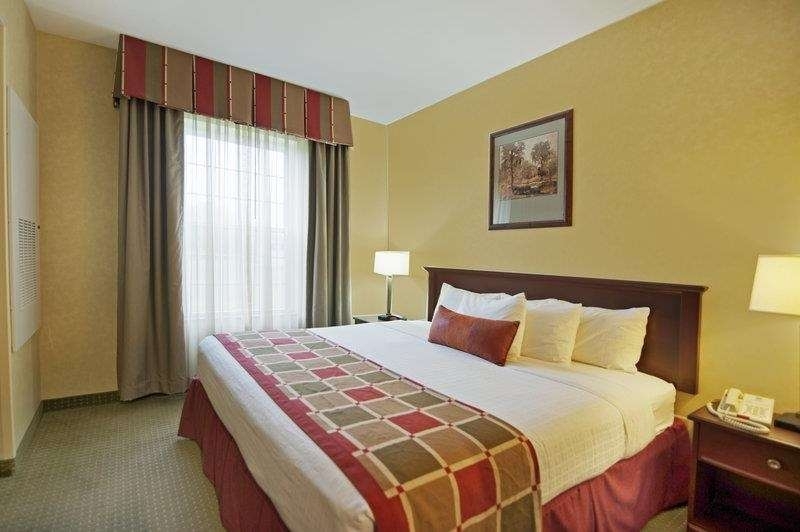 "Stay Here while visiting Ticonderoga, NY!" I love staying at this Best Western. The staff are so upbeat and pleasant. I loved the way Kelly engaged 2 young children at the front desk...he was so appropriate. Our room was very comfortable, well appointed and reasonably priced. This is the place to stay if you come to Ticonderoga, N.Y.! Very Nice Hotel - clean, excellent staff and wonderful breakfast included. Very close to Fort Ticonderoga and other shops in the area. Very quiet environment. Plenty of parking. Seems to be well kept up and has a wonderful staff on site. This was a typical mid range motel, but seemed expensive for the locale. Dinner was good, but crowded. We didn't think we would need a reservation on a Thursday, but we had to sit in the bar due to lack of tables in the dining room. Breakfast was make it yourself, not a fan. Room was clean and bed was comfortable. Thanks so much for your response! We are so glad you had a great stay and meal at our restaurant. Hopefully we will see you again soon then!! I am sorry to hear that your nights sleep wasn't great. We will look into your reservation and also the bed associated with your stay and see when that bed was replaced last. I also wanted to thank you for bringing this to our attention as we can now deal with it. Hope you have a great rest of the summer and hope you will try us again next time you are in our area. 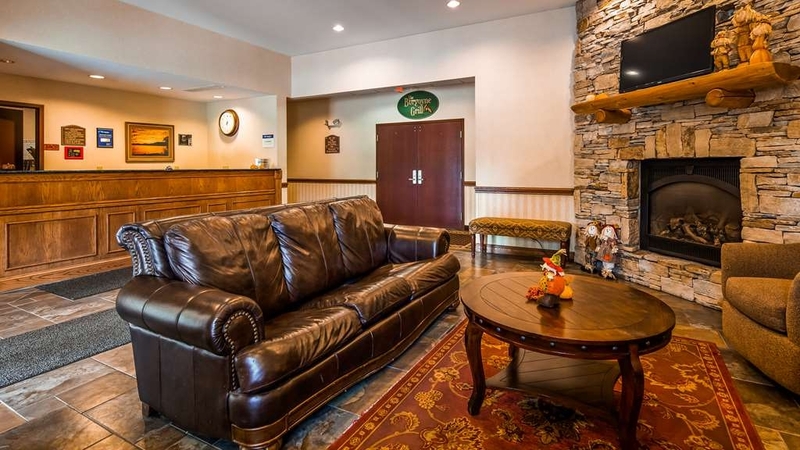 Before our recent trip to Ticonderoga we thoroughly investigated all the places to stay and chose the Best Western Ticonderoga Inn and Suites. It was a wise choice. The rooms were clean and well decorated. The staff was courteous and professional. They have a nice restaurant on site, which offers a continental breakfast in the morning and one of the nicer restaurants in town in the evening. Bottom line, this is the place in Ticonderoga to stay. Excellent hotel for the price. Very clean. Great dinner food.. Excellent service at the restaurant. Breakfast was a very good continental breakfast. Great staff. Very accommodating to your needs. Cookies at the front desk was a nice touch. Close to the Fort. It was great! There were many guests there for the weekend but you could hardly tell. Pool was great and place was nice. Not a bad option at all if your looking for something more luxurious than a cabin and happen to be in the upstate Ticonderoga area. The hotel is located in a quiet neighborhood away from the highway! Staff is friendly! Price is OK! It has a restaurant on site! Close to other eateries & WalMart! Ft Ticonderoga is a short drive from the hotel. Was on hold, two different lines, two phones for OVER ten minutes to inquire about an existing reservation. Ready to search other options in area and will cancel this one at the very last minute if I find something. This was a great place to stay while we were visiting family just down the road. Never managed to eat breakfast although there was a great buffet. The bed was huge! Coffee maker in the room was a bonus. Thanks for staying with us, and sorry you missed out on our great breakfast. We offer fresh made scrambled eggs, waffles with homemade compote, and lots of pastries and fruit options. We also always have yogurt, cereal, and toast. Next you come make sure and check out breakfast as we have been making some enhancements' like build your own yogurt, waffles, and oatmeal bar, it is sure to be fantastic!! This was a great place to stay in order to visit Fort Ticonderoga. It is fairly new, built about 7 years ago. There are not a lot of places to eat near the hotel. Make dinner reservations as soon as you know you are staying there, as locals go there to eat and the place is full. We ate at the bar. The food was exceptionally good and the service very friendly. Great hotel with many amenities. Staff is very kind. Excellent specialty food nights in the restaurant with a chef cooking to order. Great experience. Was in Ticonderoga on business for 3 days. Rooms appointed very nicely, very clean and up to date. Would highly recommend this location. Thank you so much for your response, and helpful comments. Our Chef attended Pasta night is a favorite with hotel guests and locals alike. He does a fantastic job and tries to offer some great specials as well! Hopefully next time you are traveling in our area you will stay with us again. "Clean, affordable in off season"
Clean Affordable rates in off season. Bar closes early like 9pm even on a Saturday so don't plan a social meeting here. Noisy guests in other rooms and no one seems to pay attention to them like occasionally walk the property. First thank you for staying with us, and secondly I am sorry that you found the hotel to be noisy. We require rounds from all shifts and will be checking into this to make sure it doesn't happen again. Hope you have a good rest of your holiday season! Stayed here with a group doing a reenactment at Fort Ticonderoga. We reserved based on a group rate. Facilities were excellent for our purposes with short drive to and from the fort. In house restaurant was good and necessary as we found good alternatives hard to find. Rooms were clean and comfortable. Thanks so much for staying with us! We work hard to have an ongoing working relationship with Fort Ticonderoga and are glad to hear you enjoyed your reenactment and our hotel! If you enjoyed the reenactment so much you should check out their war college seminars they offer twice a year, once in May and once in September. They are excellent! Hope you have a great rest of your holiday season! Nice place. Good Location. Nice staff. Good Breakfast. Easy to find location off of route 74 and 22 Near Fort Ticonderoga, Mount Defiance. Very scenic location that is especially nice during the fall. Thanks so much for staying with us and glad to hear you had such a great stay!! Our leaf peeping season has been especially beautiful this year, the reds and oranges are just vibrant and still going strong :) Have a great rest of the Fall! "An outstanding hotel with a fatal flaw"
This property is located down a scenic rural side road, and presents itself beautifully. The lobby and the room were clean, well appointed, and everything in the room worked. However, I was given a room with a connecting door, and I suspect that was the cause of my problems with this stay: the couple in the next room literally sounded like they were in my room. They spoke in normal tones and did nothing more than unpack and settle in (thank GOD), but I heard every word and could hear the zippers and catches working on their luggage. Bizarre. Loved the room, but I would NOT stay here again; there's no way of telling if the noise problem would be solved by getting a room without a connecting door. A shame, but for me that was a dealbreaker. I actually phoned my wife and told her to get online; I refused to talk to her on my cell under those conditions. 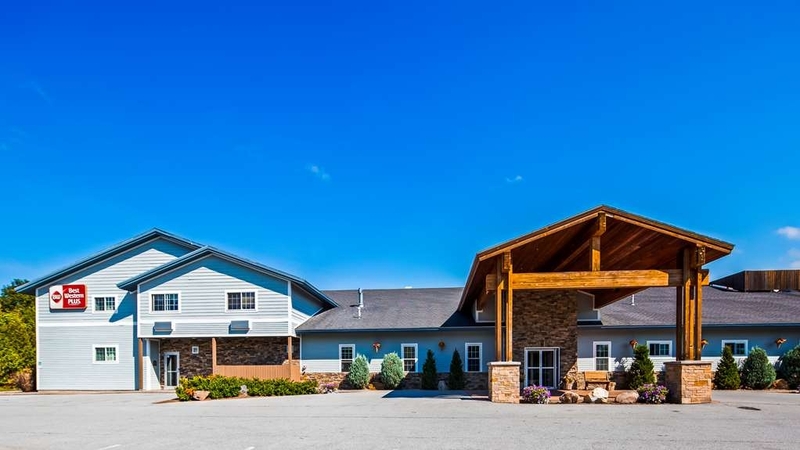 We strive to make each guest whether new or returning to feel at home, from our hot cookies to our friendly staff throughout the building to our amazing Grill! I have made mention to housekeeping about turning the air on in the incoming rooms to just get the air circulating, thanks for the recommendation! We stayed at the Ticonderoga Best Western on our way back from Maine via Stowe Vermont. A nice scenic alternate route he that avoided the high traffic areas of CT and MA. The accomodations at the hotel were excellent.Fall foiliage was near peak in the area. It was nice to have a good restaurant right in the hotel. No need to look around for a place to eat after a long day driving. Hotel staff was friendly and helpful. Room was clean. Could have had a desk lamp available for the table in the room. Breakfast was good. Do Not Stay At This Hotel!!! The stay was supposed to be charged to my prior to my stay (advanced pay), however the charged my card in bits and pieces. The staff and their service was unprofessional, non caring. This was my wedding anniversary, and the staff ruined the whole trip. I will NEVER Stay at any Best Western ever again. We stayed at this hotel for two nights during a trip to upstate New York. The hotels was very clean, the rooms are large and staff was excellent. We stayed in a King Suite and the room was very large with a separate living room area. The living room area had a tv, desk and plenty of plugs for your laptops, cell phone, etc.. The room also had a refrigerator and microwave. The bathroom was pretty big and was updated and very clean. The bedroom was nice, bed was comfortable, and there was a tv in the bedroom. 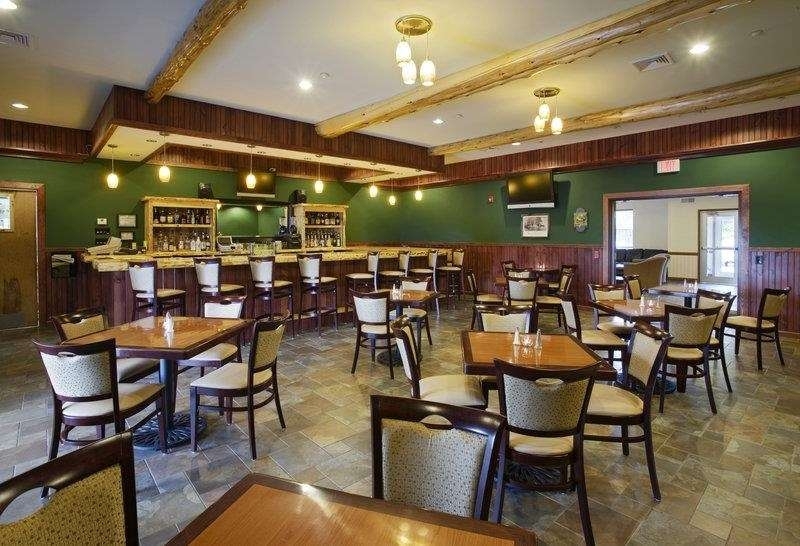 Overall a great hotel with a restaurant and bar on first floor off of the lobby area. I would stay there again. This hotel was great, clean, and staff was excellent. We stayed in a King Suite room and it was very clean and very roomy. There were two tvs in the suite which was great, bathroom was updated and overall a great place to stay and a reasonable price. I picked this off the internet as we were driving as a waypoint on our trip. We came in late at night and left early morning. The staff was friendly and room was clean and comfortable. We wish that we have more time in the area to explore and have more time at the hotel. When we return to the area to explore, we will definitely use this hotel. We look forward to you using our hotel again next time you come to the area! We have so much to offer, hiking, two beautiful lakes, and Fort Ticonderoga as well. Have a great rest of the Fall! "Good Base For Touring the Area"
Let me get the "caveat" out of the way first: We were looking for a reasonably priced hotel near Middlebury, Vermont, and this Inn was listed as being 16.7 miles away, so I'm thinking "that's only 20 minutes, no problem". Unfortunately that's 20 minutes if you're a canada goose. For those who are travelling by car, it's more than 35 miles and takes about 50 minutes by winding country roads, going first north to the Crown Point bridge crossing then southeast to get there. We found the Inn to be clean, the rooms spacious, and the staff very pleasant and helpful. There is a restaurant/bar which serves quite good and very reasonable food and a good variety. My husband's fried clam basket with wonderful french fries was only $9 and my prime rib (served only on Thursday and Saturday) was $19 and so enormous that we took the leftovers with us and it was dinner for both of us the next day! It was obvious that the bar portion of the restaurant is a local watering hole, but the patrons did not disturb the diners. They were short-handed on Saturday and the food took a long time to come, but they were doing their best and the server was racing around as fast as she could. Two small annoyances: The pillows in our room were more like square throw pillows with shredded foam - glad I brought my own; and the room safe was bolted to the wall at floor level, so you would have to lie on the floor to read the numbers or the instructions. 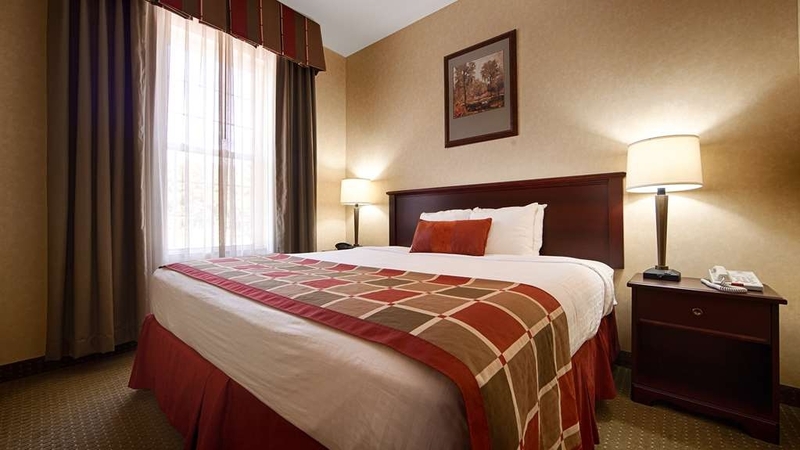 "best Best Western I have stayed at"
We got a great rate on a room here at the last minute for a leaf peeping trip. The room was clean and well appointed. The bathroom looked brand new. The beds were comfortable. The breakfast was basic, but free is free. We would definitely stay here again. There is a restaurant and bar on site but we didn't eat there except for the included breakfast. "great hotel but not a great burger"
Great hotel, clean, very pleasant staff. If you eat at the grill there, eat it downstairs in the restaurant. Service for the room was not good. The bartender never called to tell me my dinner was ready so by the time I went down to ask about it and brought it back to my room, it was wilted and not hot. This motel was a very nice find , clean rooms , friendly polite staff , bar/restaurant on site , parking was great for leaving the bass boats connected to the trucks , electricity on the light polls .... Only minutes to the boat ramp at Ft Ticonderoga , plenty of gas stations and eateries only down the street . I would highly recommended this motel the price was fair and it's a real nice place ... me and my bass fishing buds are already planning a trip back next summer. Realy a great place to stay. The room was clean and large, and the beds comfortable. Totally quiet. Nothing could have been better. I requested a room on a high floor away from the elevator, which is what I got. "Great stay at the Ticonderoga Best Western"
When we checked in, we were given a hospitality bag as part of our membership. It contained only one bottle of water, even though there were two people staying in the room. There was also a bag of pretzels and a bag of peanuts. Suggestion: two bottles of water and reconsider the bag of peanuts as there are many who are allergic to peanuts. I am sorry to hear about your hospitality bag not having two waters in it. Also we have spoken as a staff about the peanuts, and I apologize for that. We try to always give water and a granola bar taking into account peoples allergies. Hopefully you enjoyed the rest of your stay with us, and will consider us again in the future! "Maybe the best in this town but..."
After stopping and seeing two real dumpy hotels we were happy to find this one. Yes the rooms are pleasant and clean if you do not mind the noise of other doors outside opening and closing. Pretty terrible ! Besides that it is a rugular hotel overpriced for the area. The restaurant looks nice but our waitress was pretty miserable. I would not recommend the steak but the mashed potatoes were delicious. All together ok for one night! "Seems to be the best motel in the area. " This place is presentable, smells OK, and clean. We stopped at one place that reminded us of the Bates motel and another that reeked of bad odors. If you visit Ticonderoga this motel seems to be the top choice.